Since the past few weeks we had been moving fairly quickly, we decided to take a few extra days to chill out in one place. 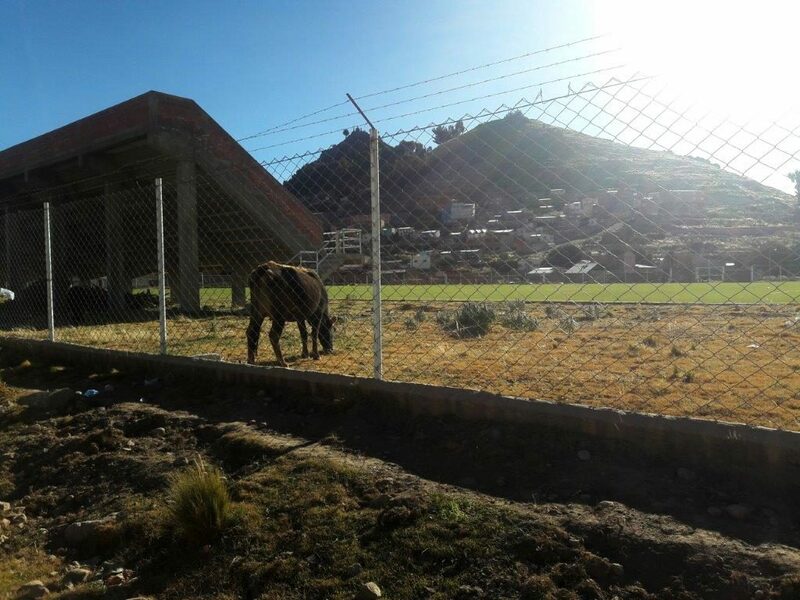 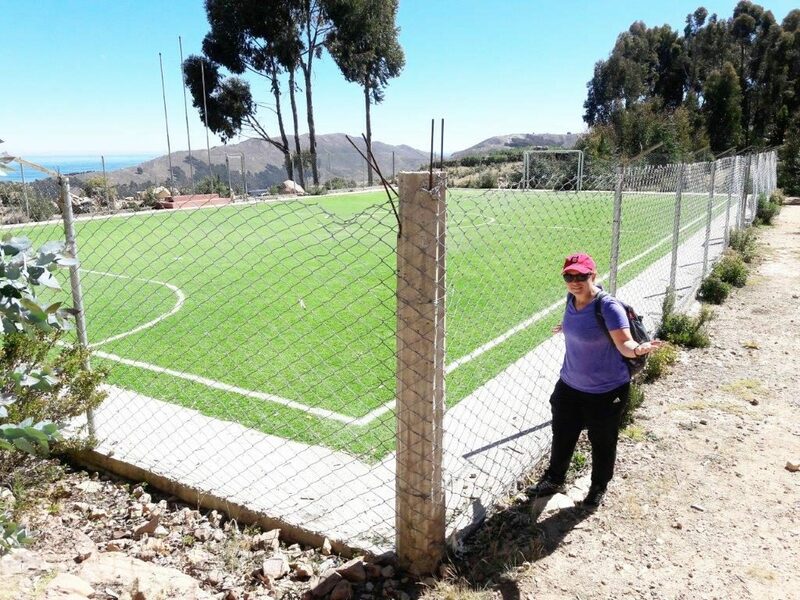 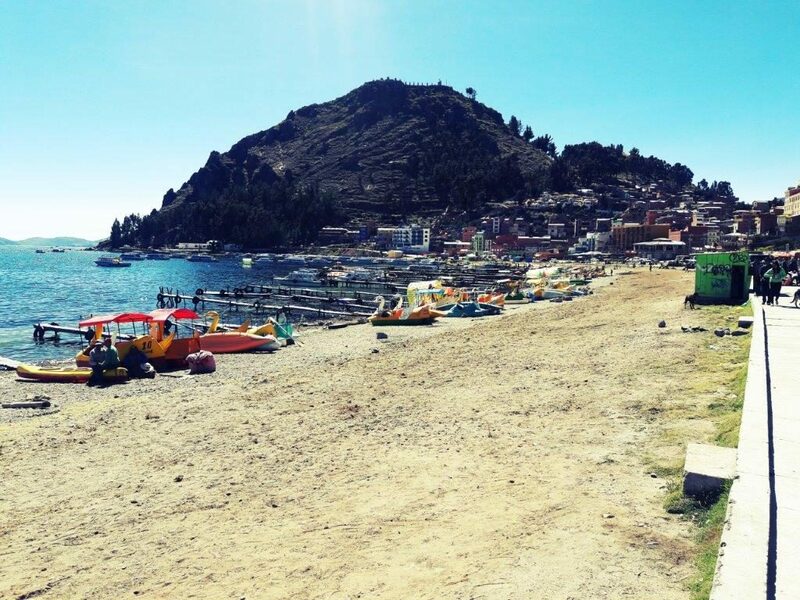 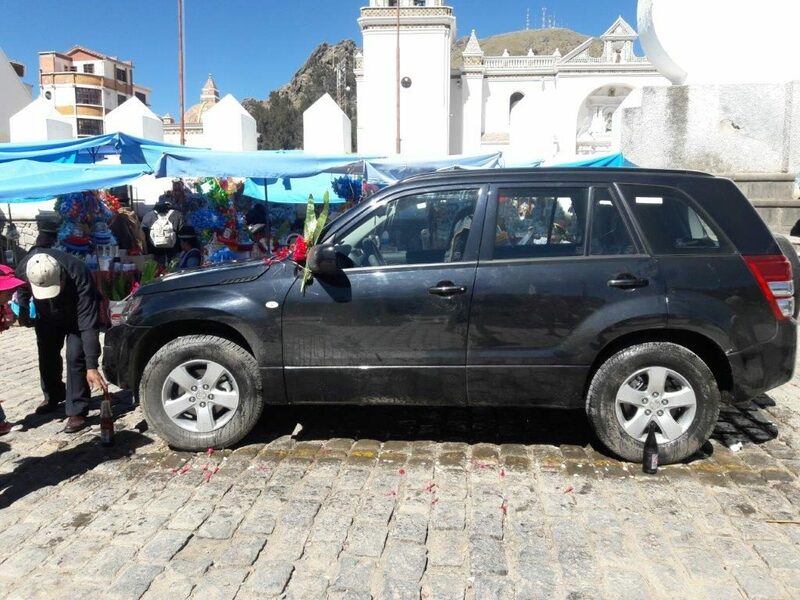 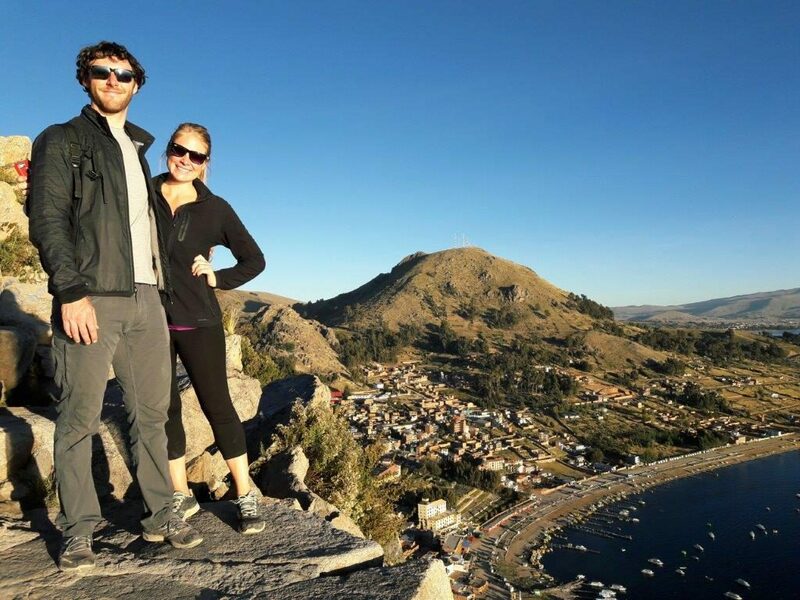 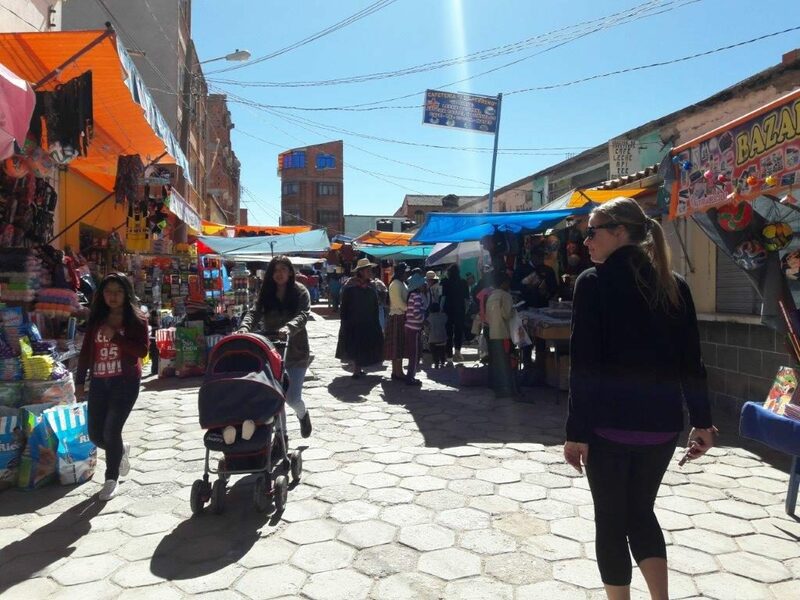 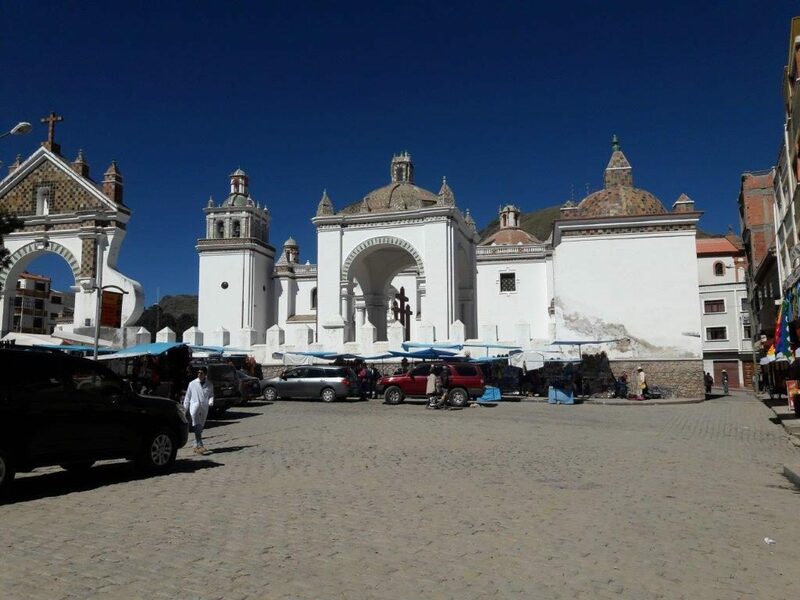 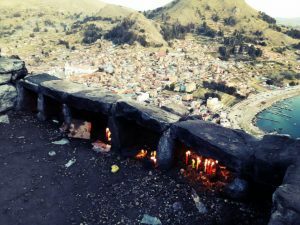 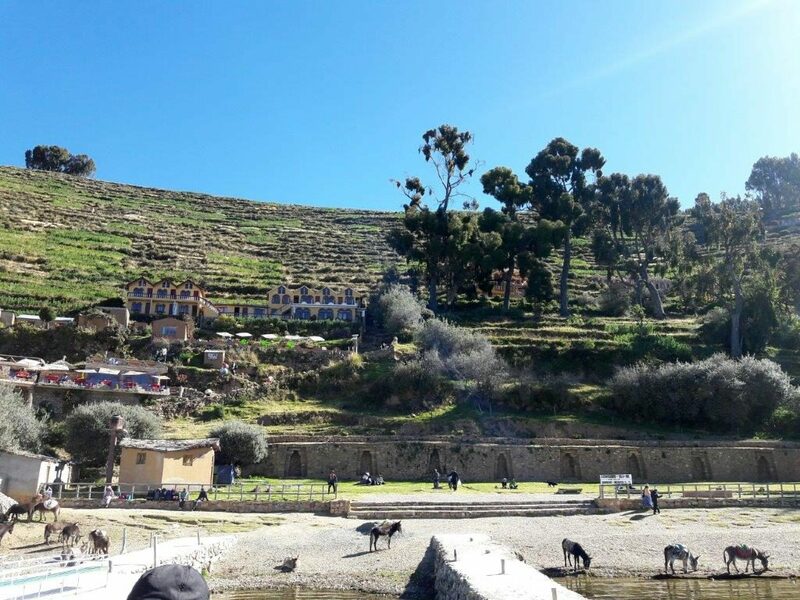 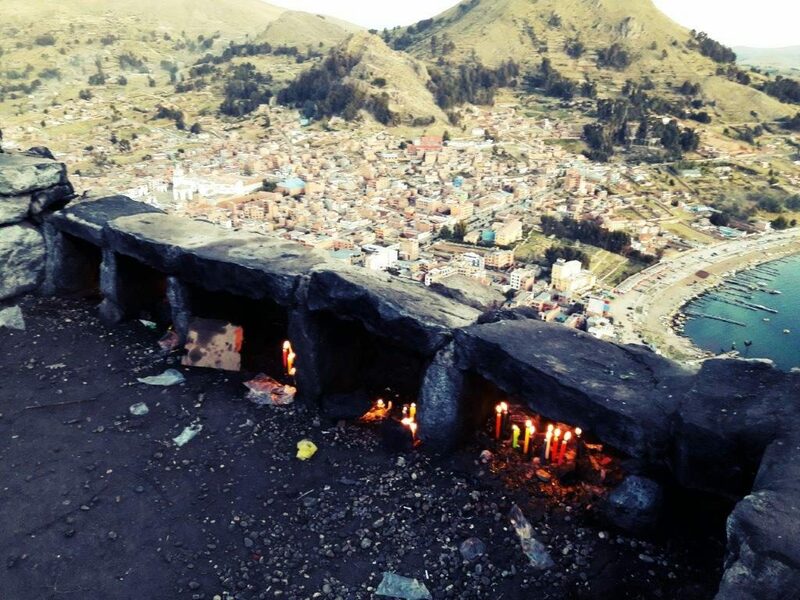 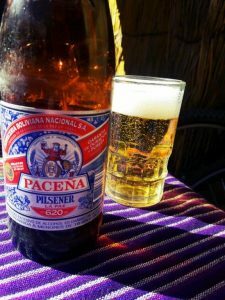 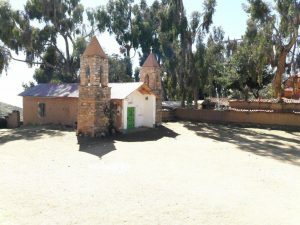 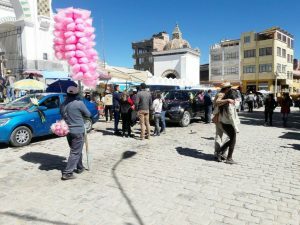 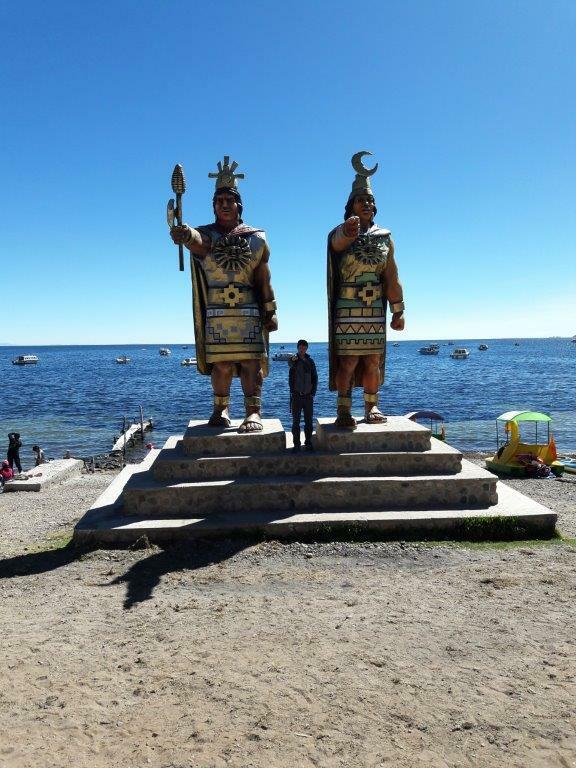 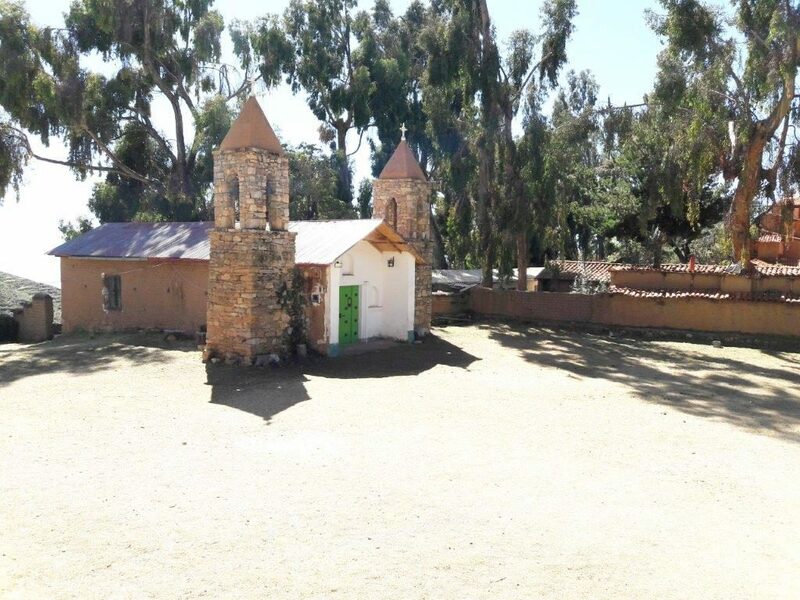 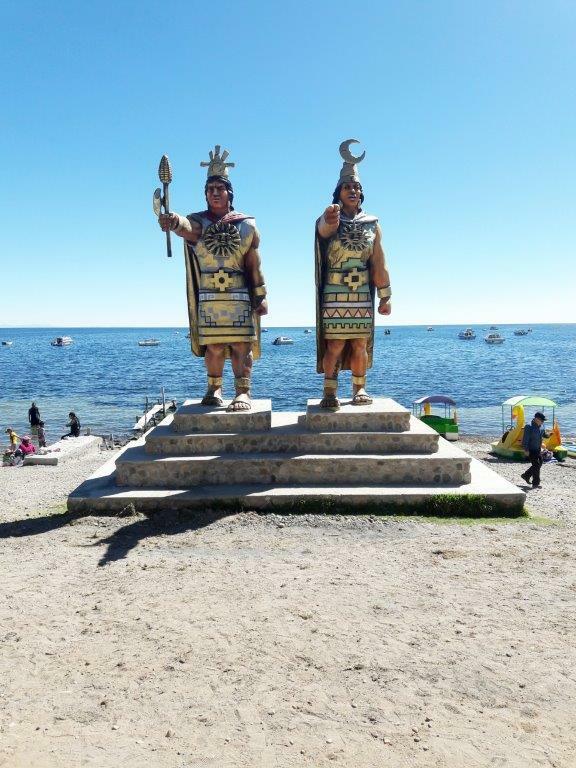 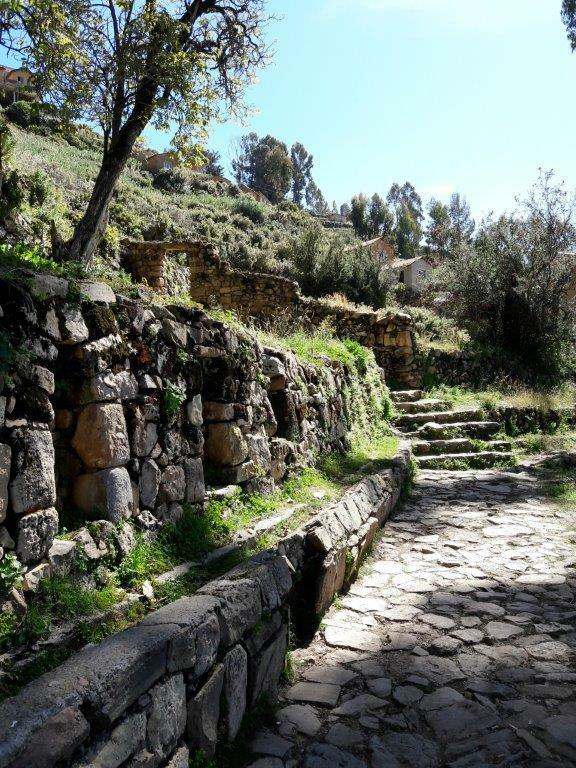 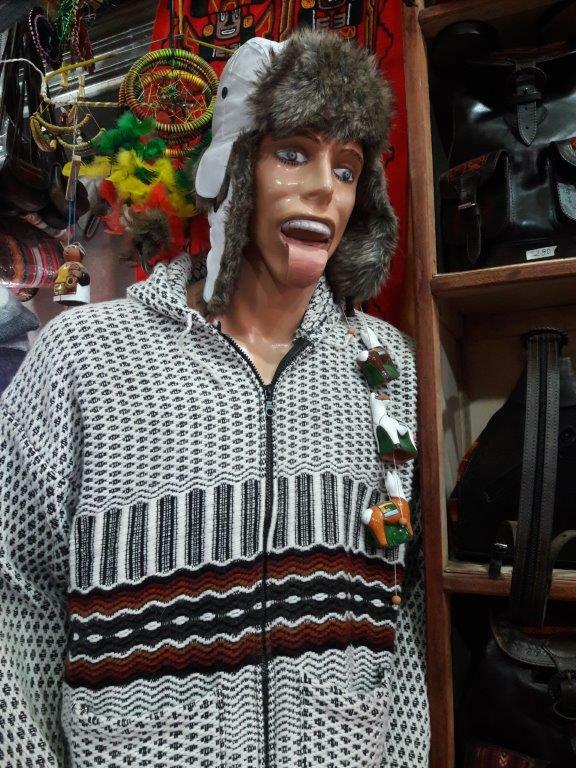 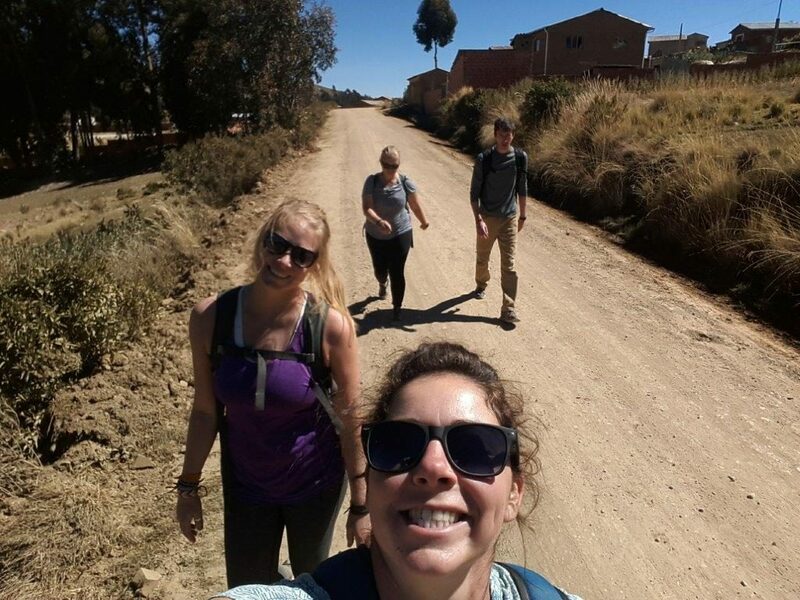 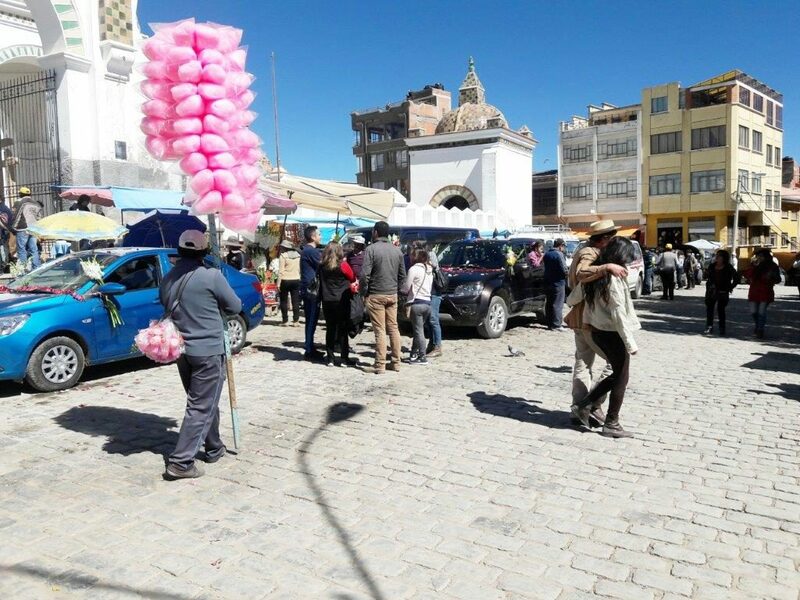 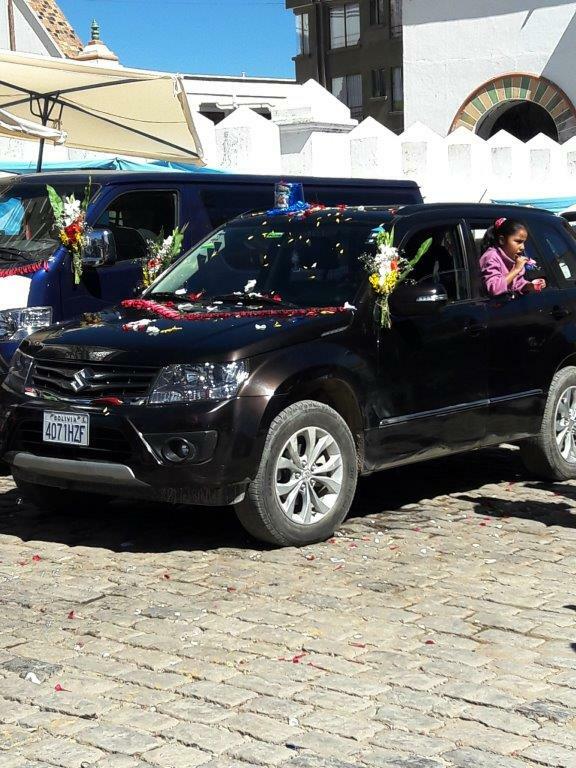 We decided that place was going to be the city of Copacabana on the shores of beautiful Lake Titicaca. It would be our highest city in elevation of the entire trip, sitting at 12,602 feet above sea level. 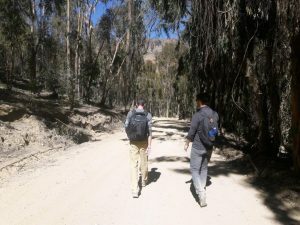 Getting there was fairly exciting in and of itself. 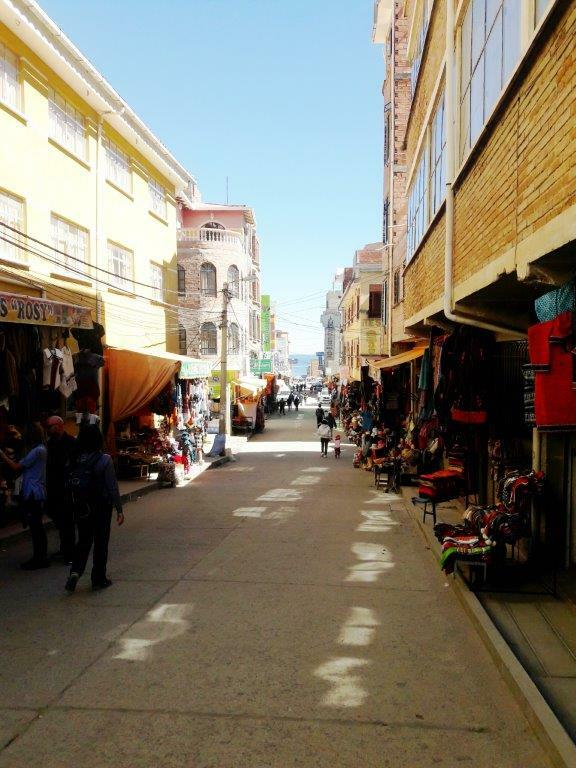 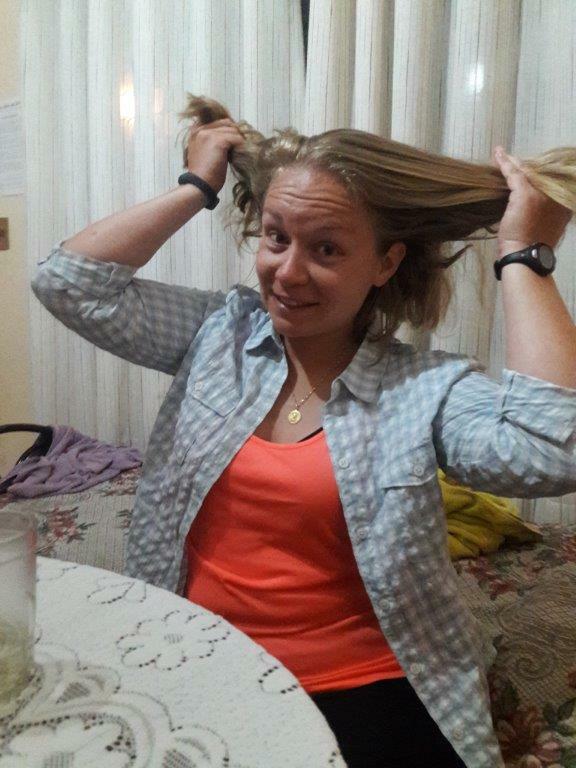 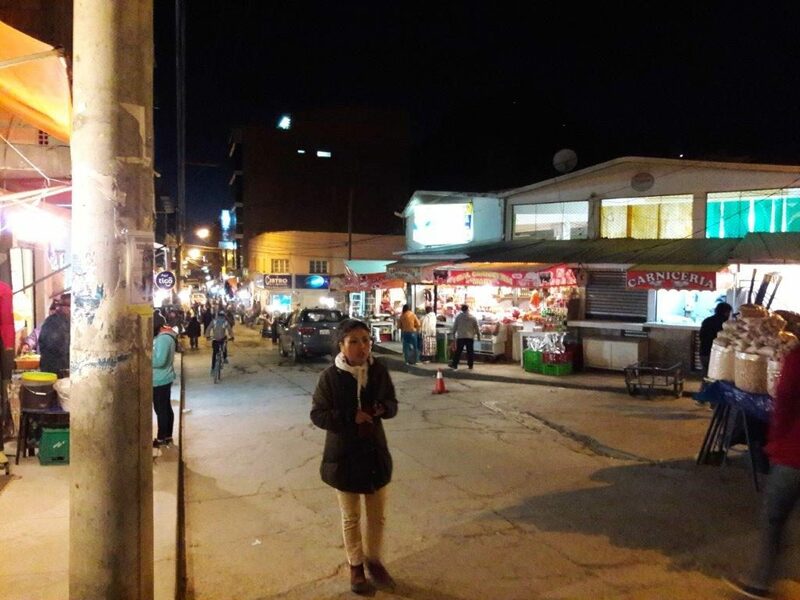 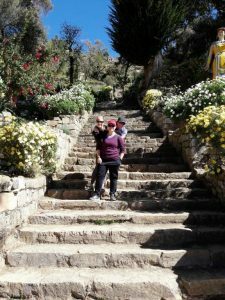 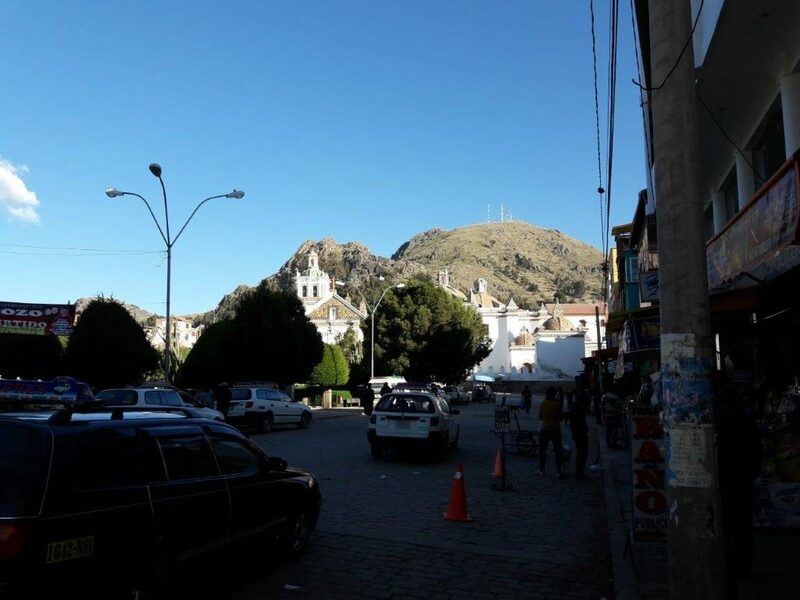 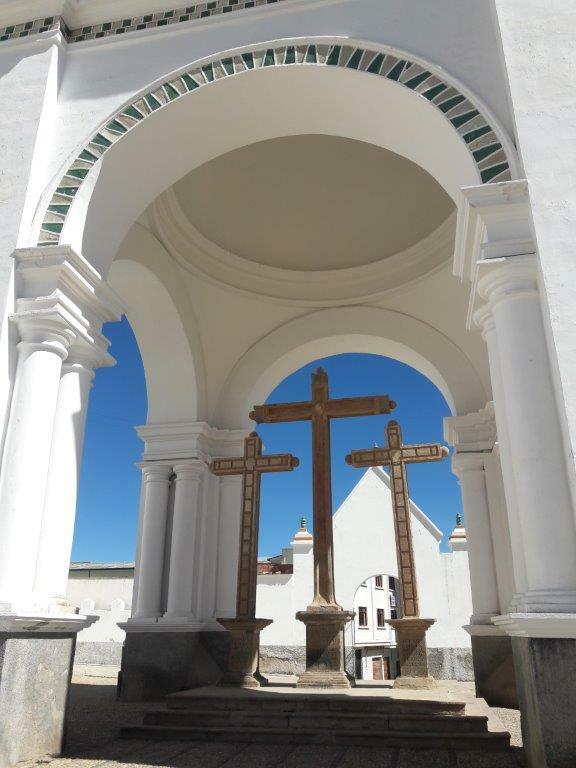 We took a long bus ride north up to La Paz, where we caught another bus bound for Copacabana. However, we did not realize that to get to the city, you have to cross a lake with no bridge. 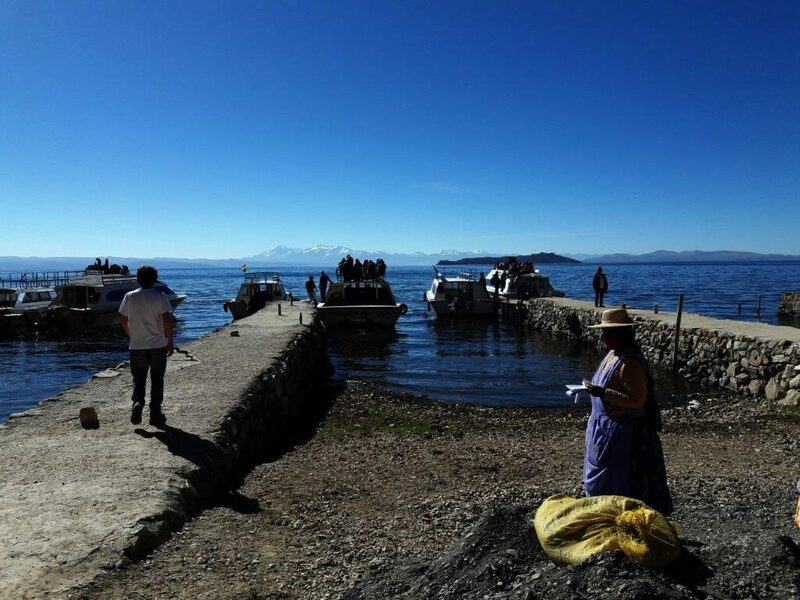 So, we deboarded the bus in a small, lakeside village, got on a boat and crossed the lake. 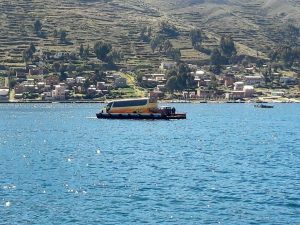 We then waited on the other side as our bus was loaded onto another boat and brought across the lake. 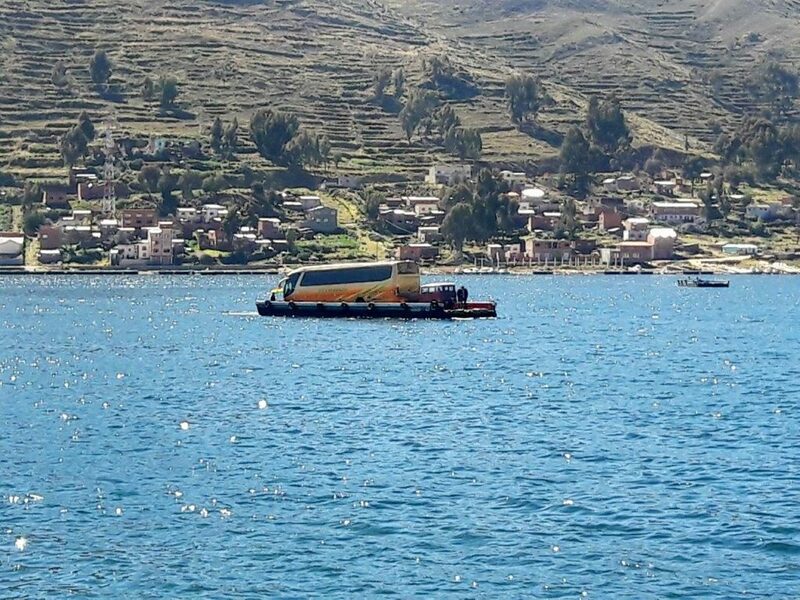 But this was no ferry-type situation, keep in mind. As this is Bolivia, a country where only 5% of their total roads are paved, the boat was made of wood and the bus looked pretty precariously perched upon it. 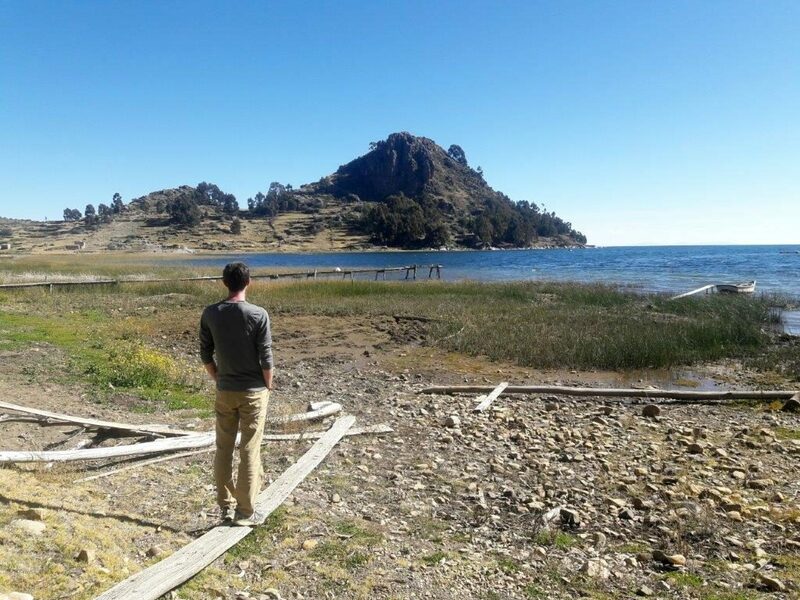 Also, there were not docks. So, the workers there had the use boards as ramps to get the boats on and off these wooden barges. 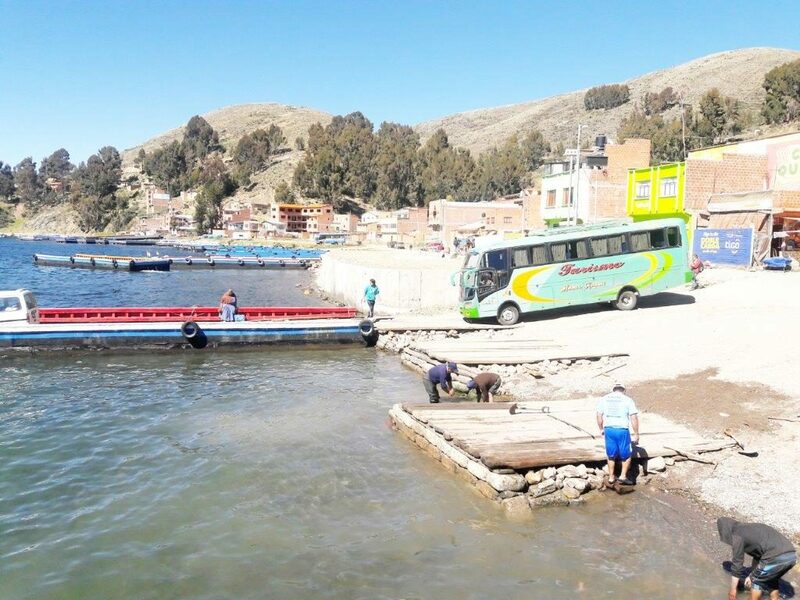 It was a sight watching everyone rushing around to get the makeshift ramp made and the bus driver had to have nerves of steel, but all in all they made it look easy. 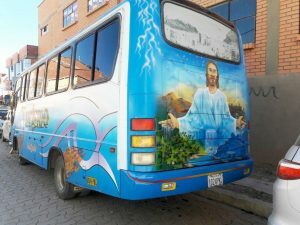 And we got back on the bus until we reached our destination. 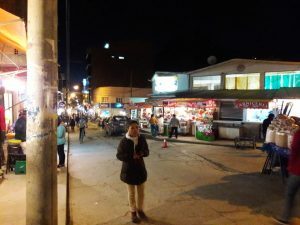 The rest of our first day was spent checking into our hostel, wandering around the streets of town, and getting a bite to eat and a couple of beers. The next day, we set out to explore the town. 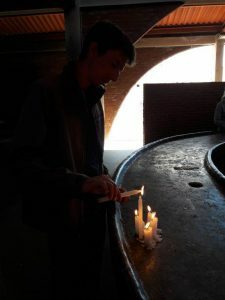 We went to the Basilica of Our Lady of Copacabana and had a look around. 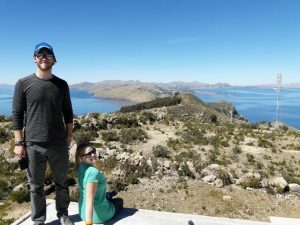 We also walked down to the lakefront to take in the sites. 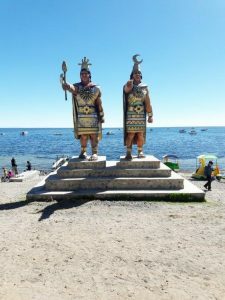 We continued to feast on trout throughout the day and enjoyed watching the ladies at the lakeside booths dressed in traditional garb and pedaling fresh fish to whoever walked past. 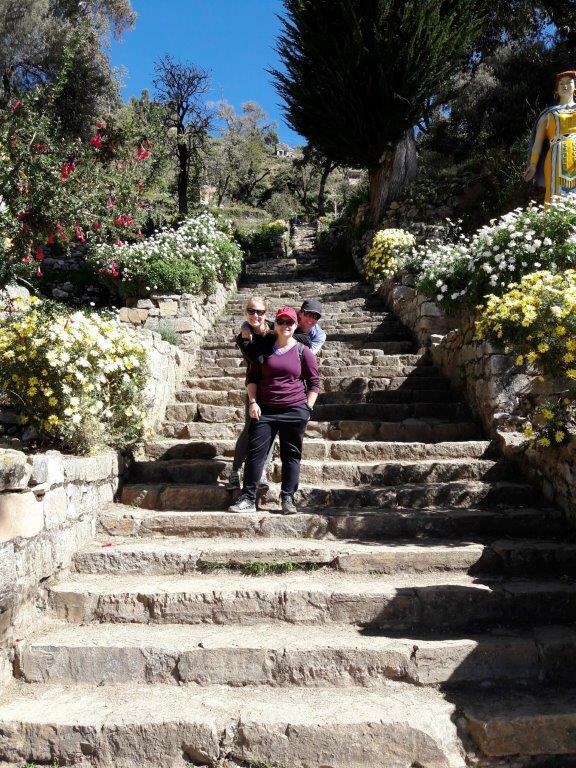 Our main activity for the day, however, was a small but strenuous hike up Cerro Calvario. 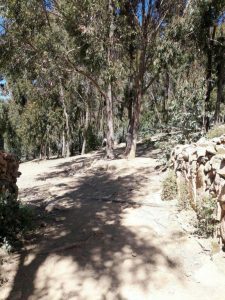 While the hike is not long at all (say 1.5 km), it is quite steep. And, when coupled with the high elevation of the town itself, it can make it seem much more difficult. 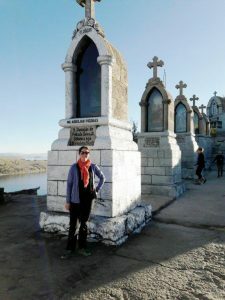 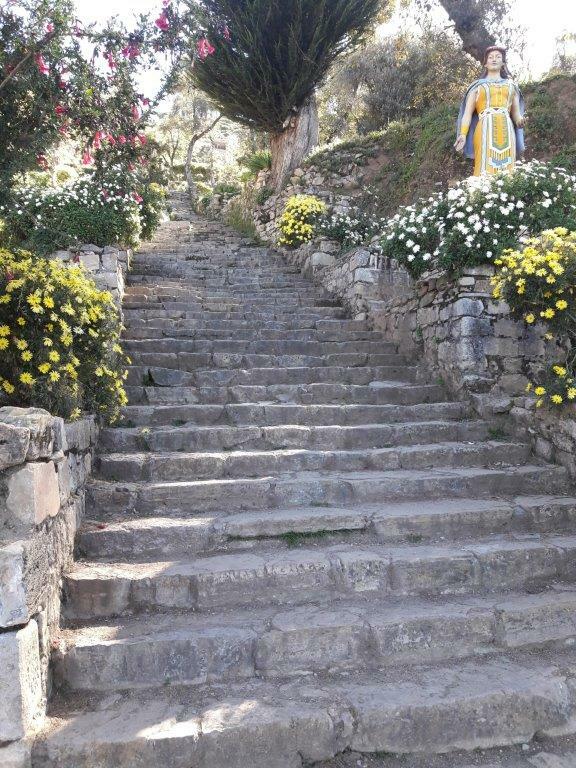 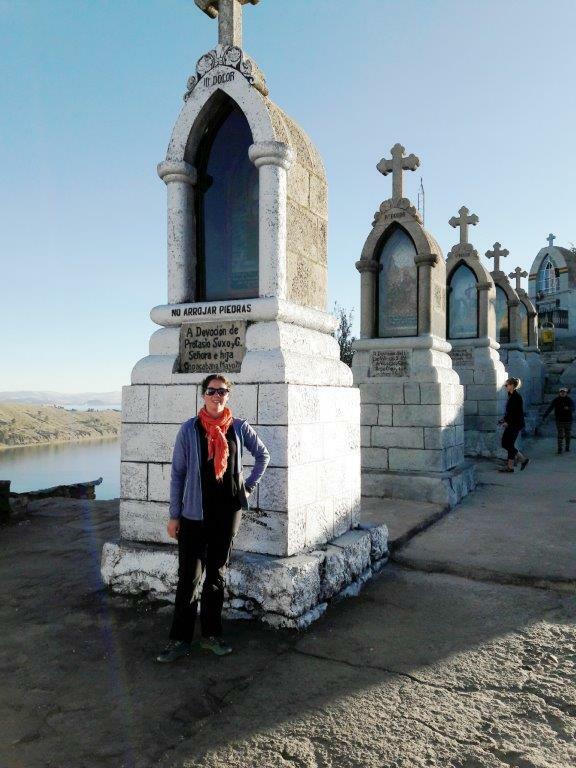 The hill features the stations of the cross and is a well-known pilgrimage site in the area. After about 35 minutes we had huffed and puffed our way to the top. 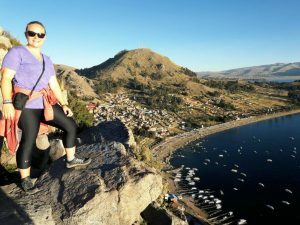 The view of the city from the peak is spectacular. 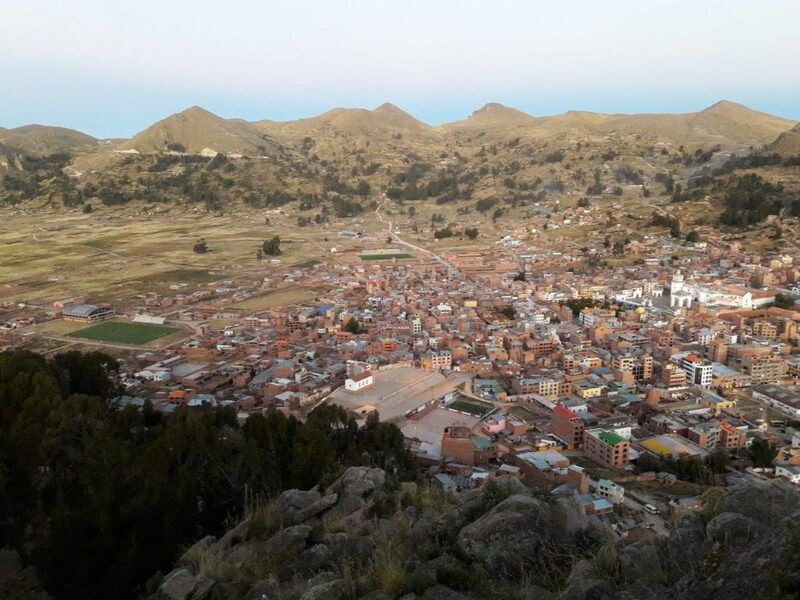 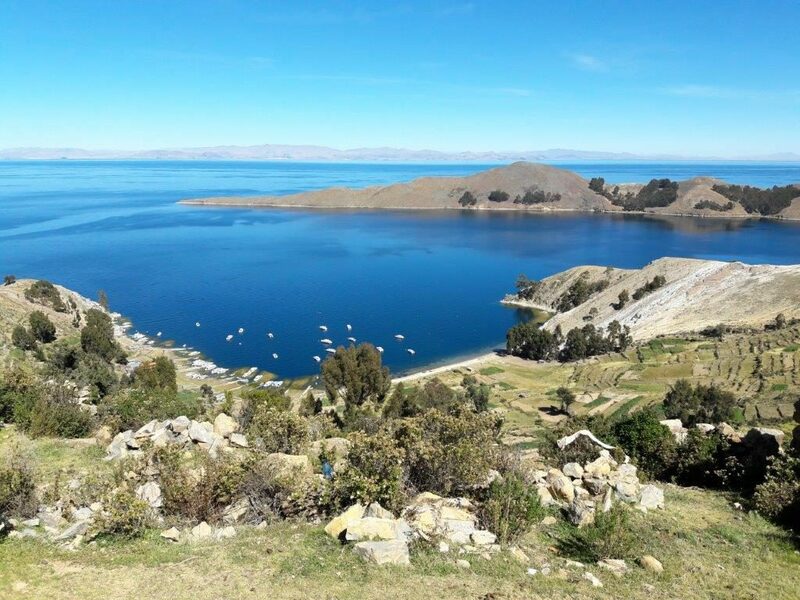 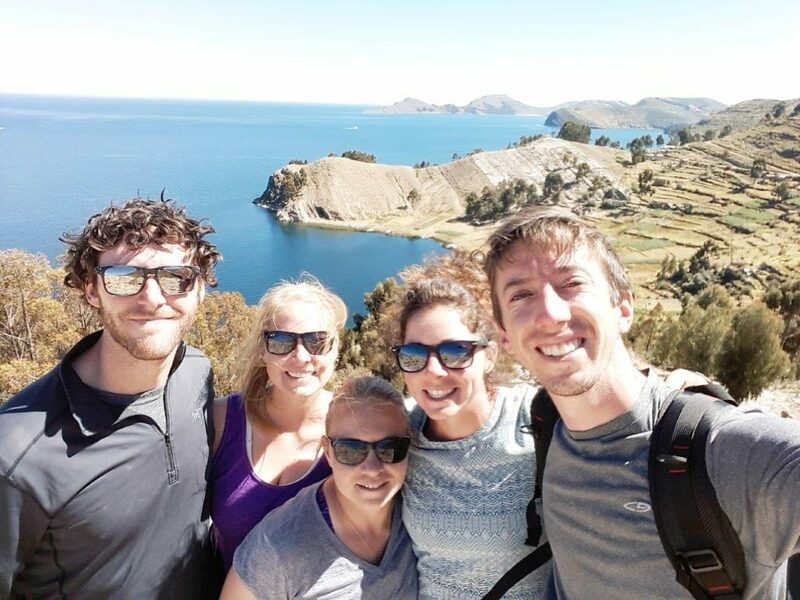 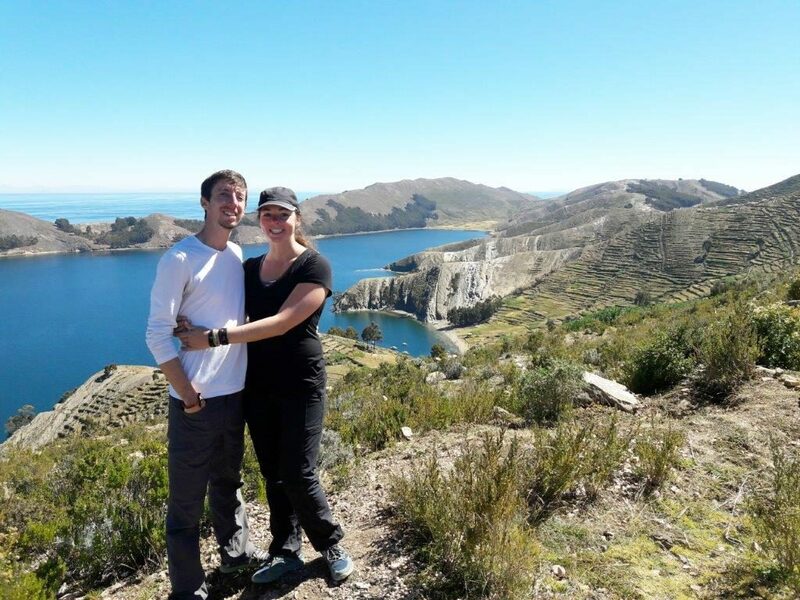 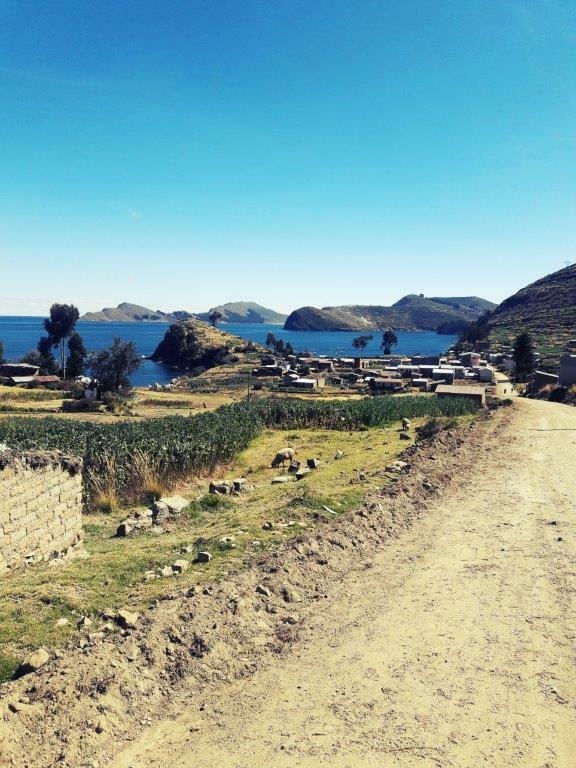 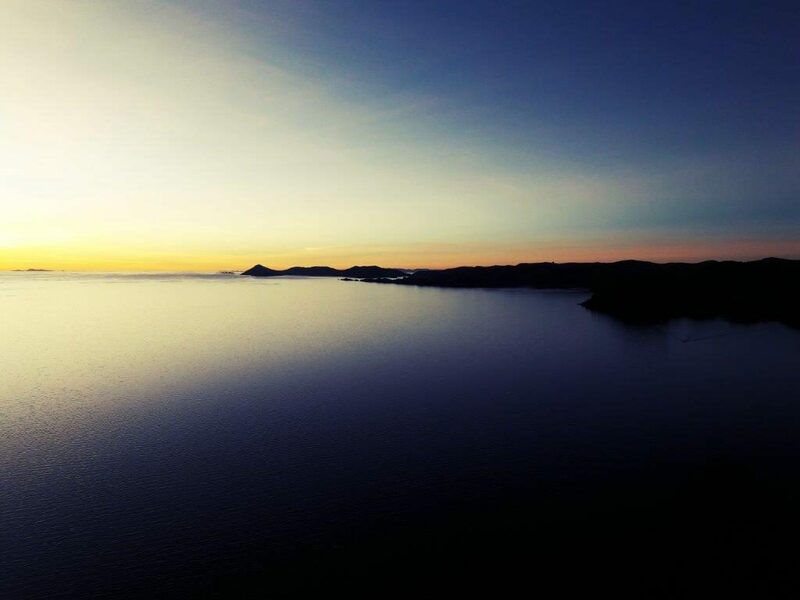 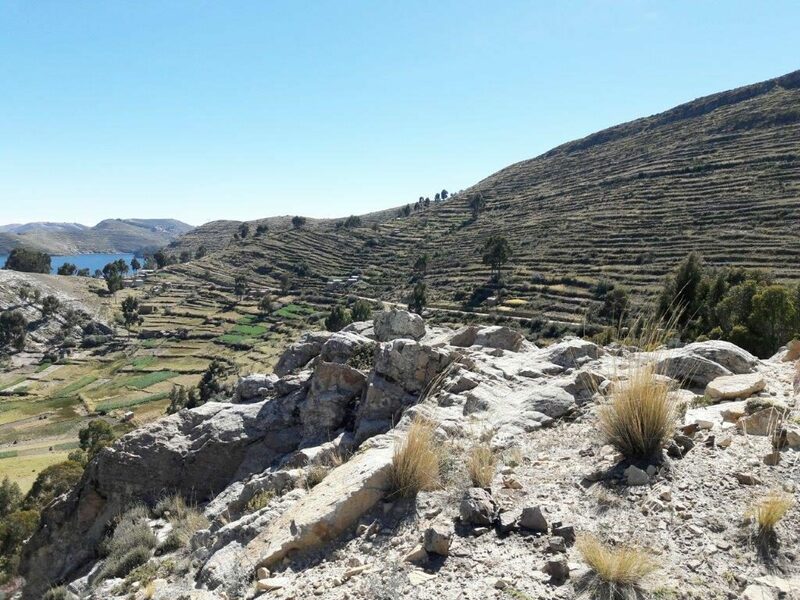 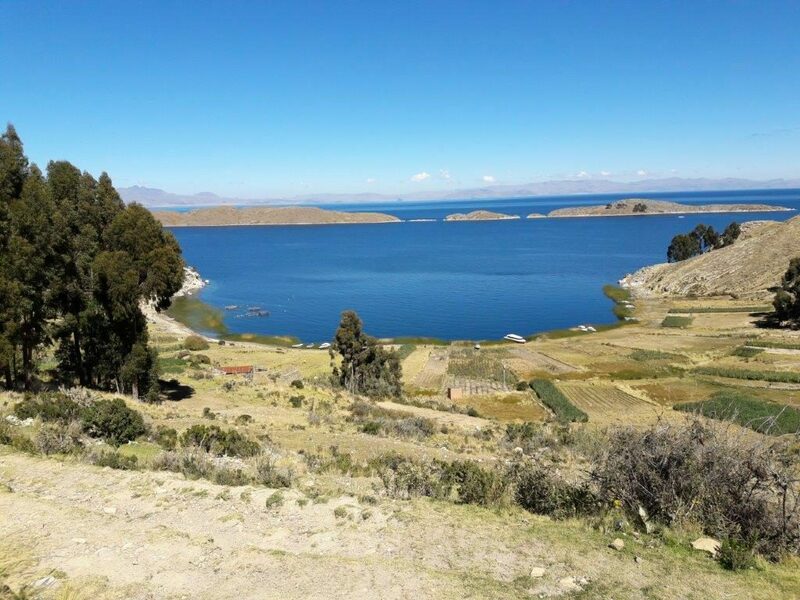 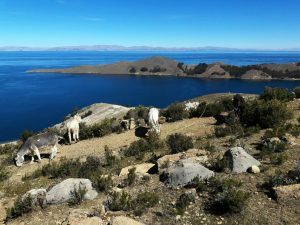 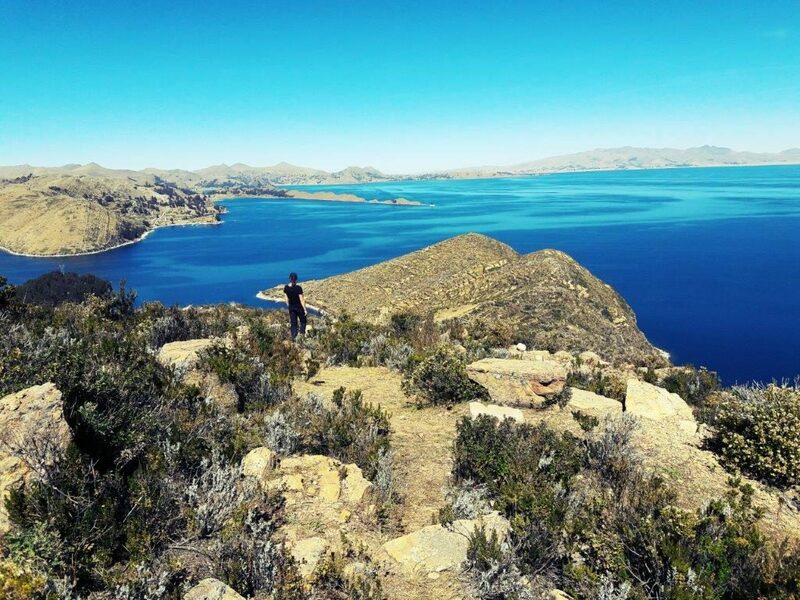 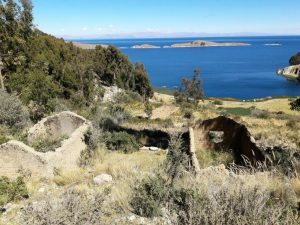 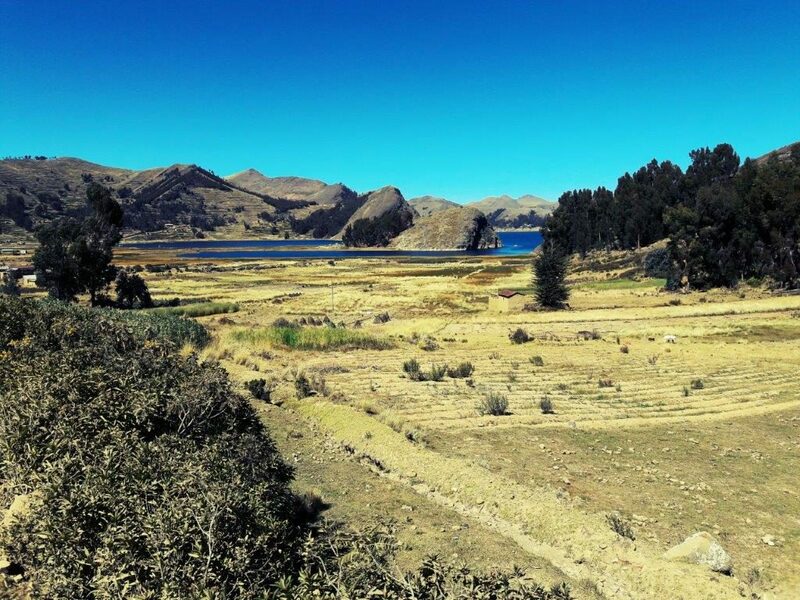 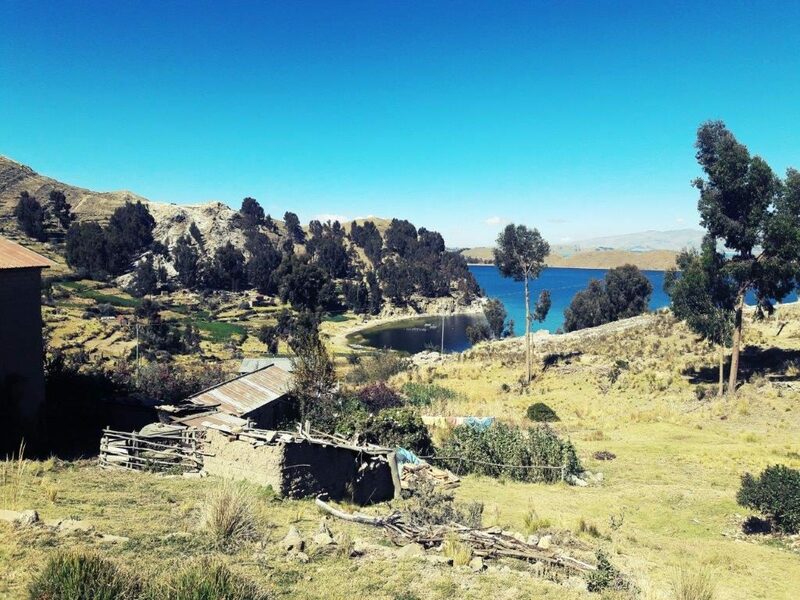 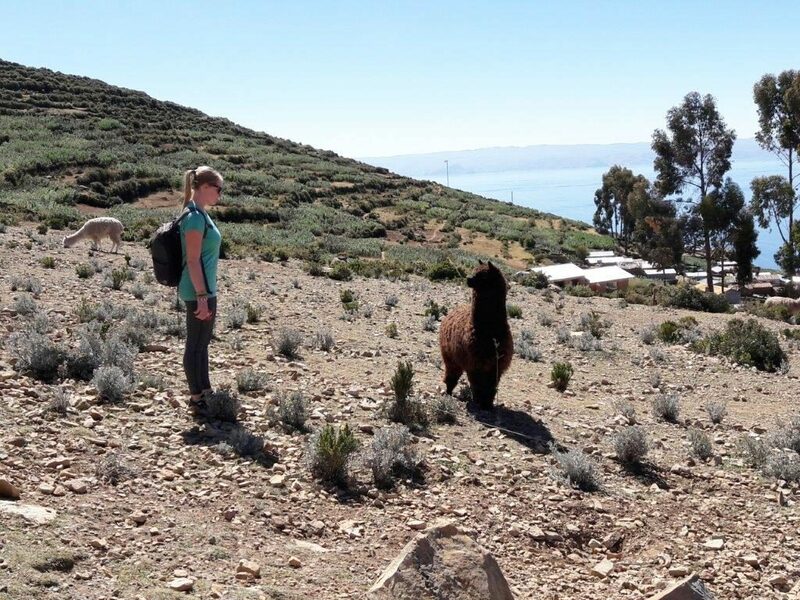 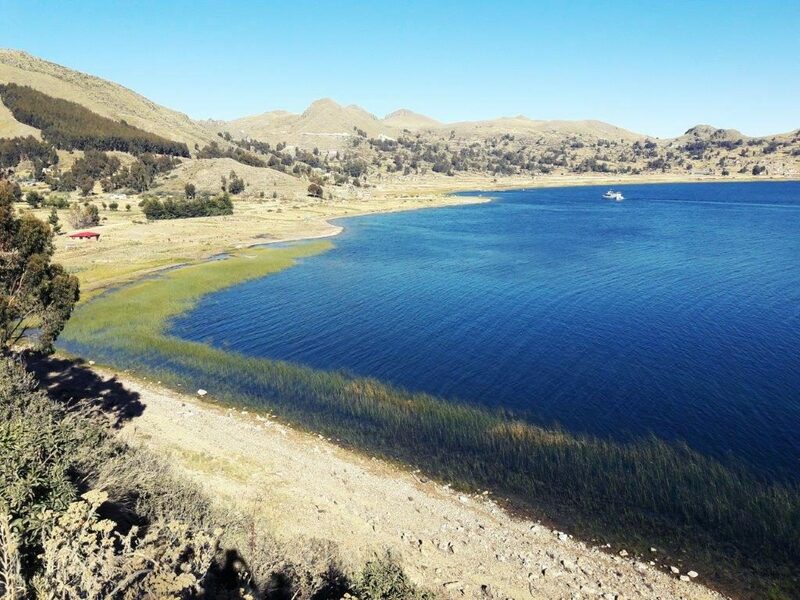 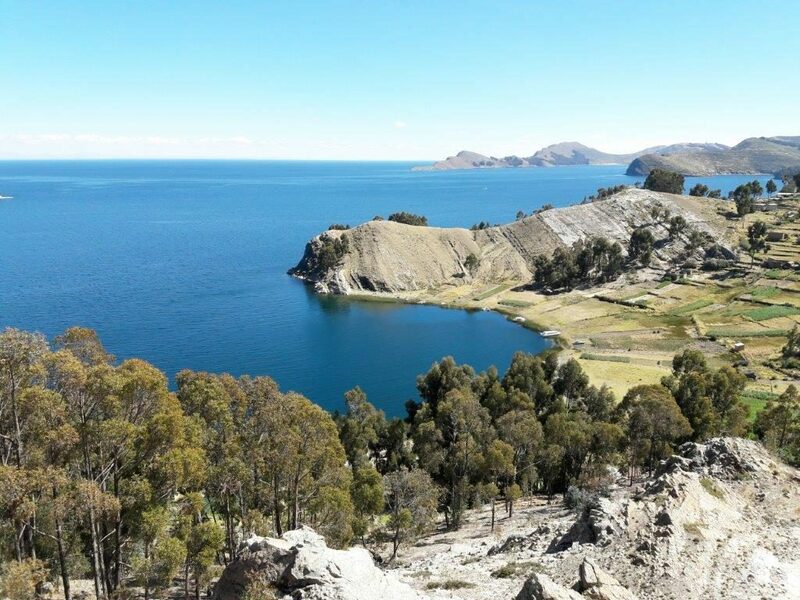 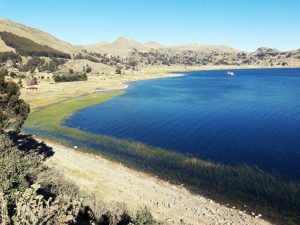 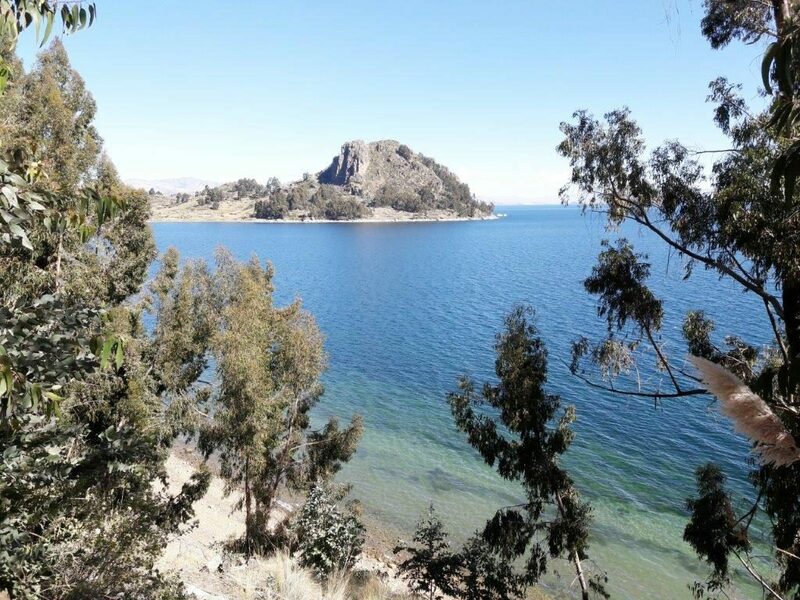 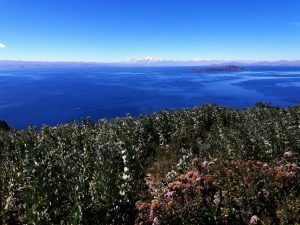 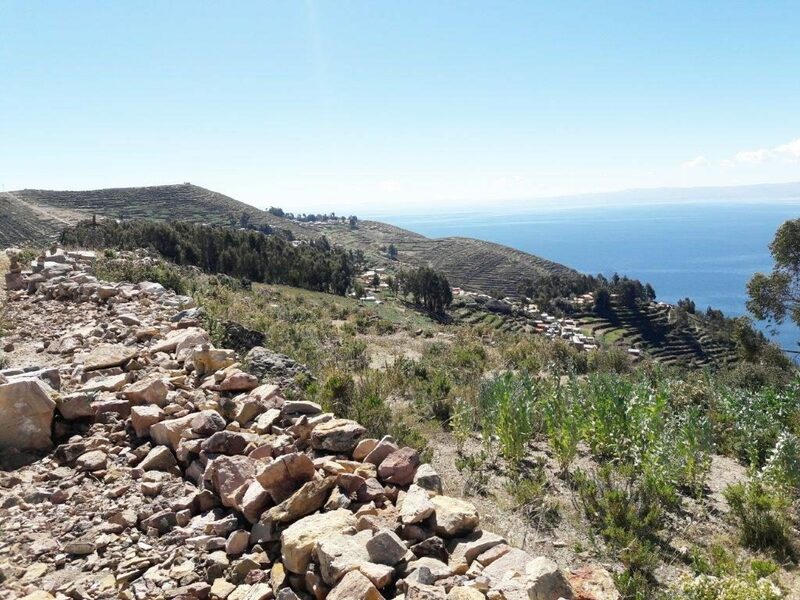 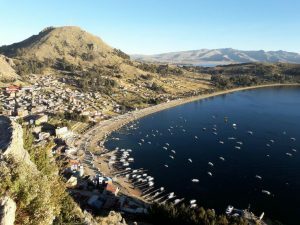 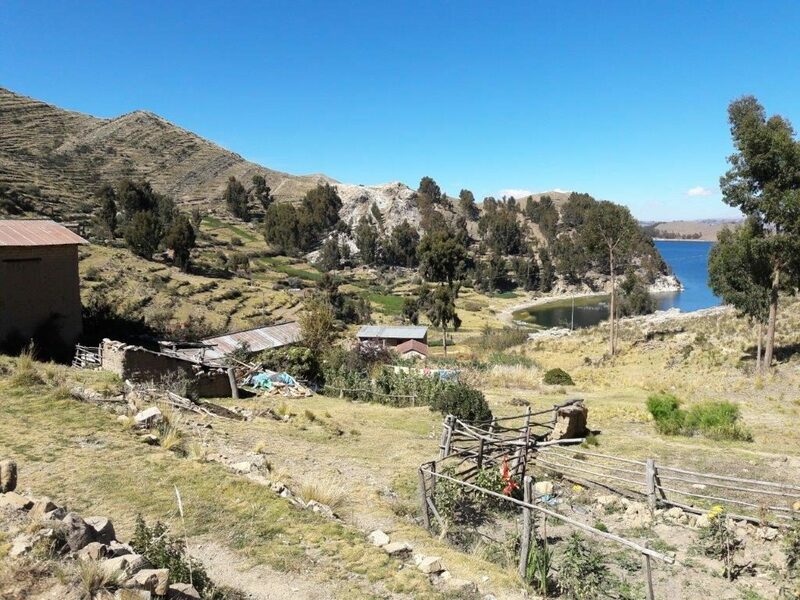 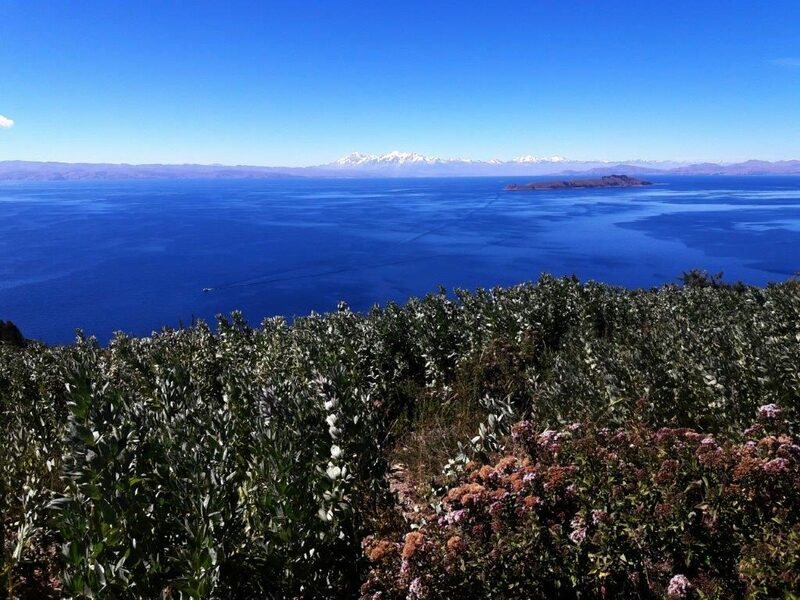 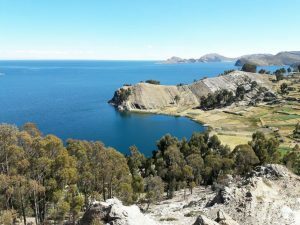 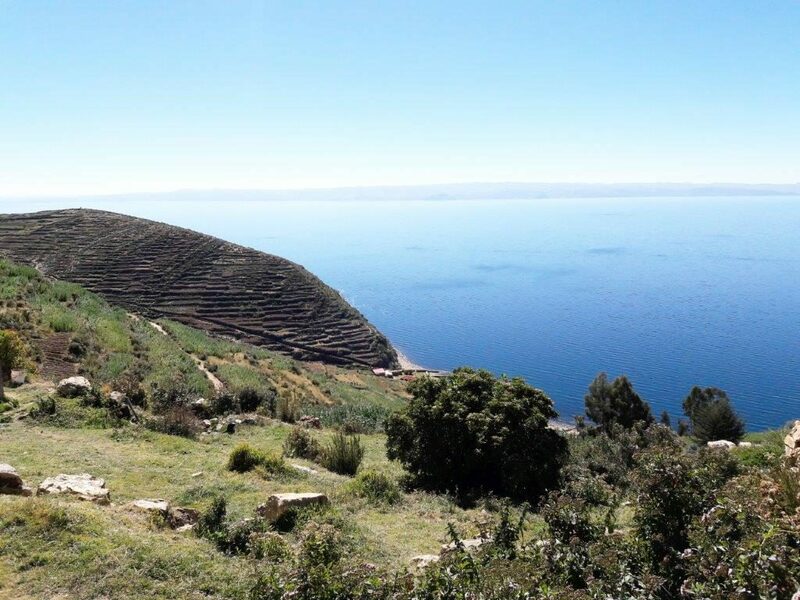 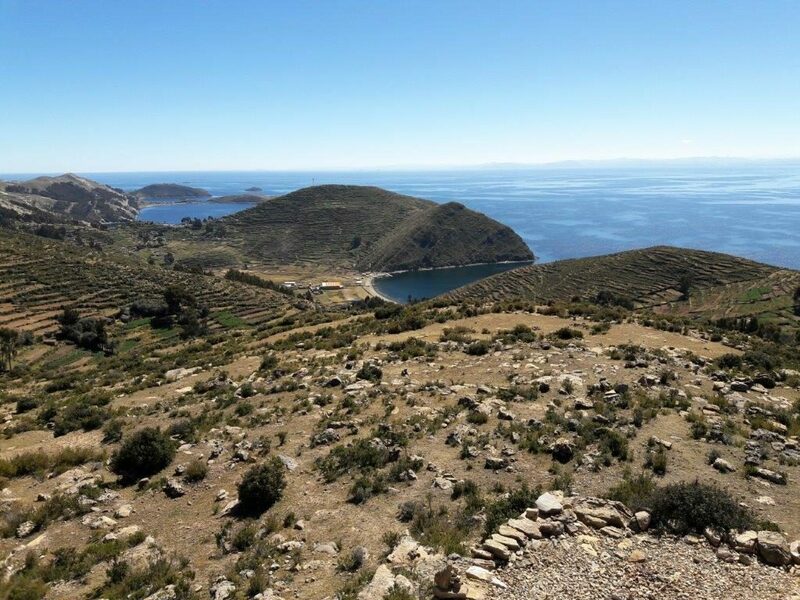 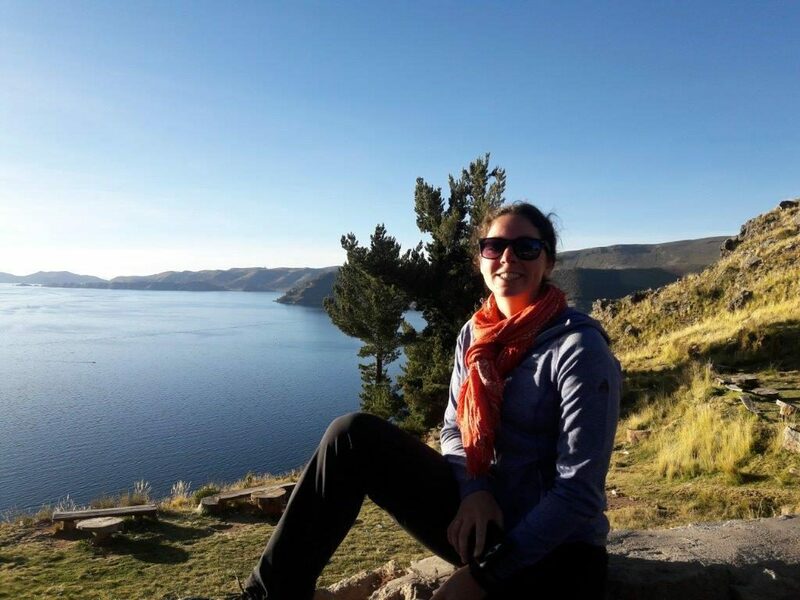 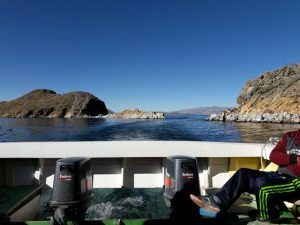 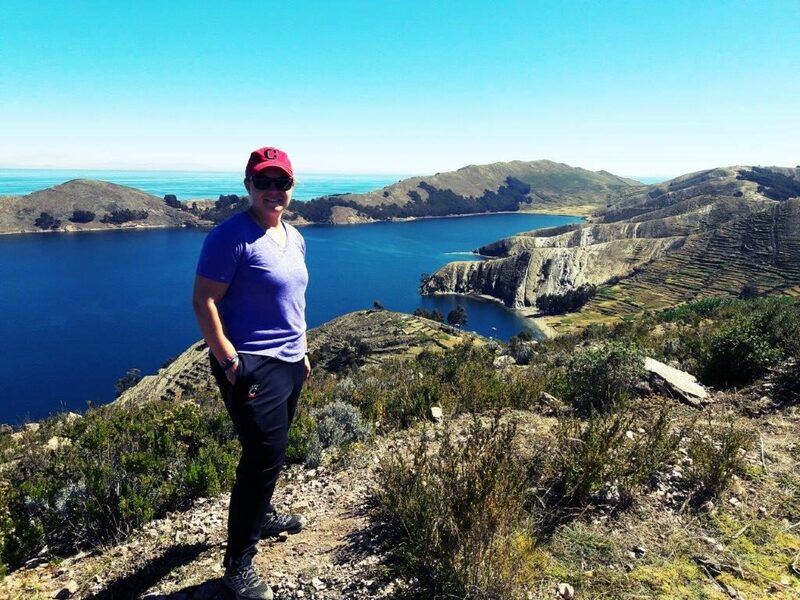 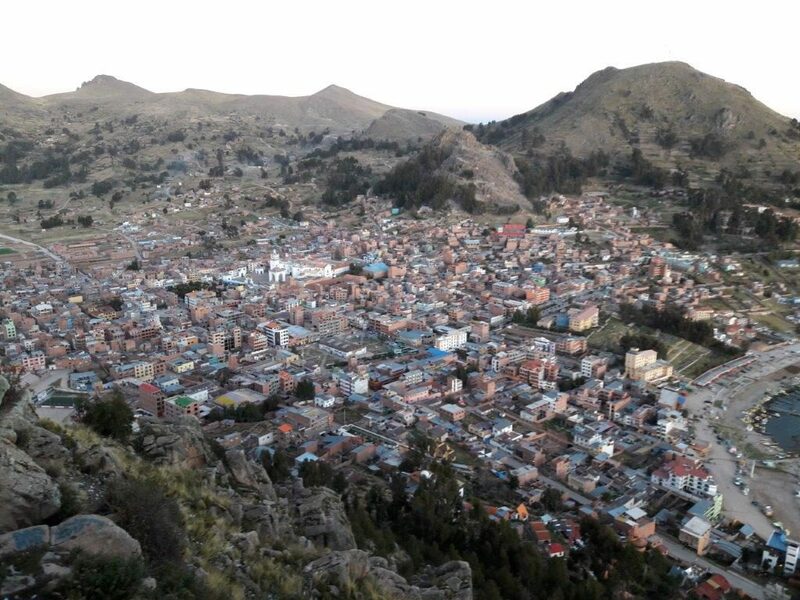 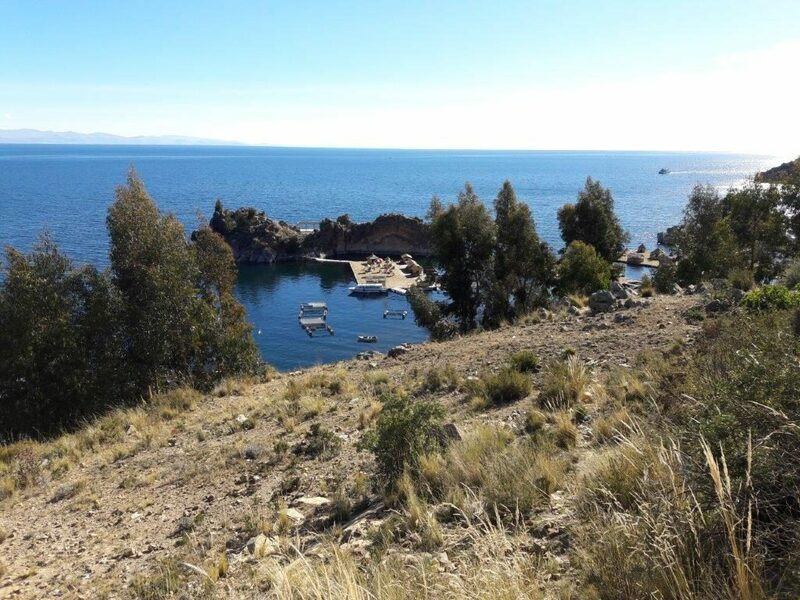 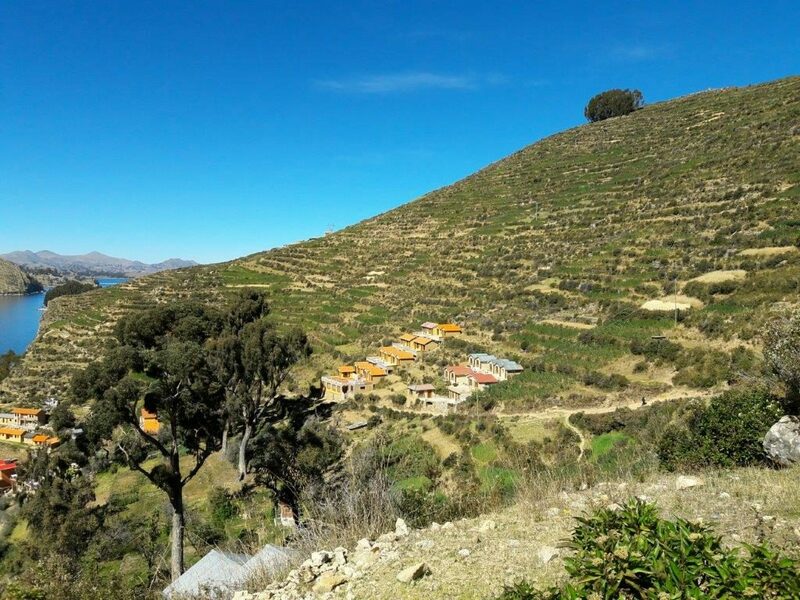 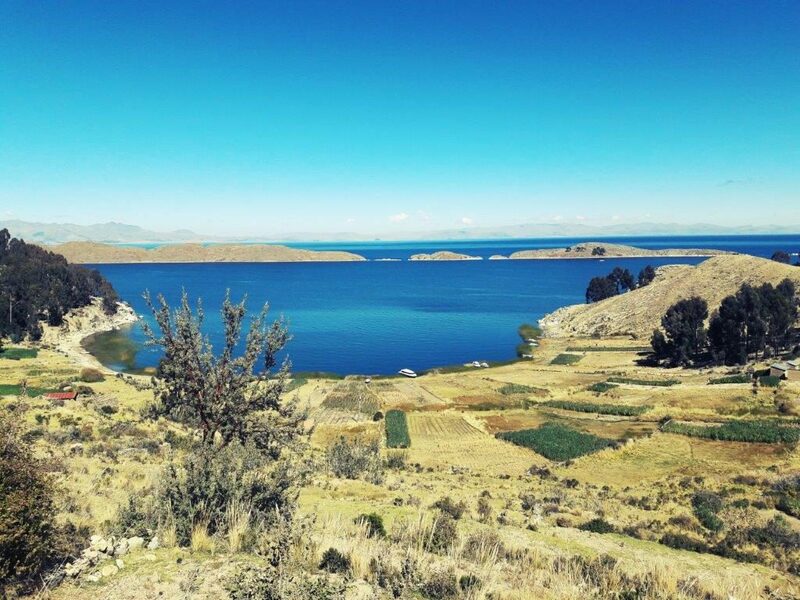 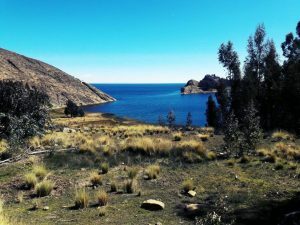 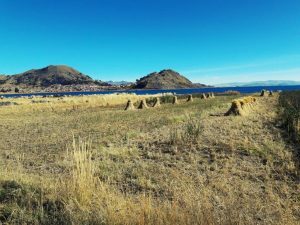 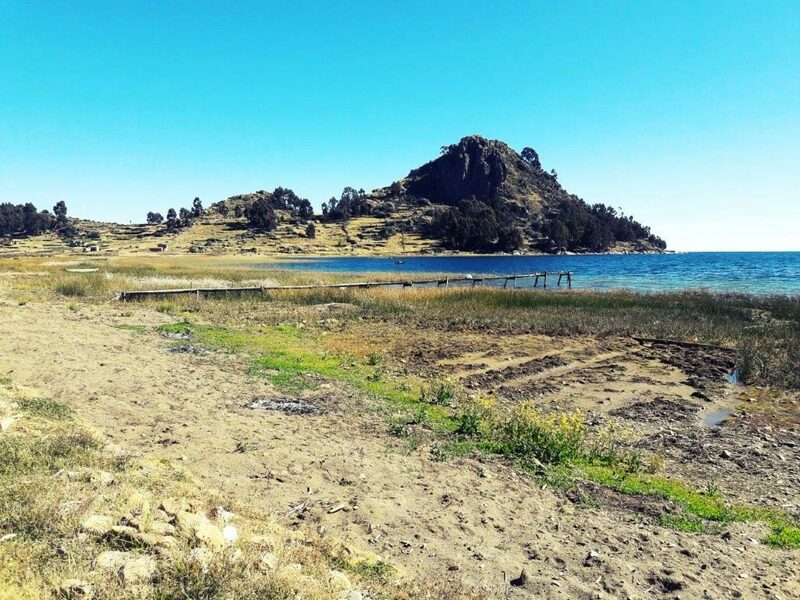 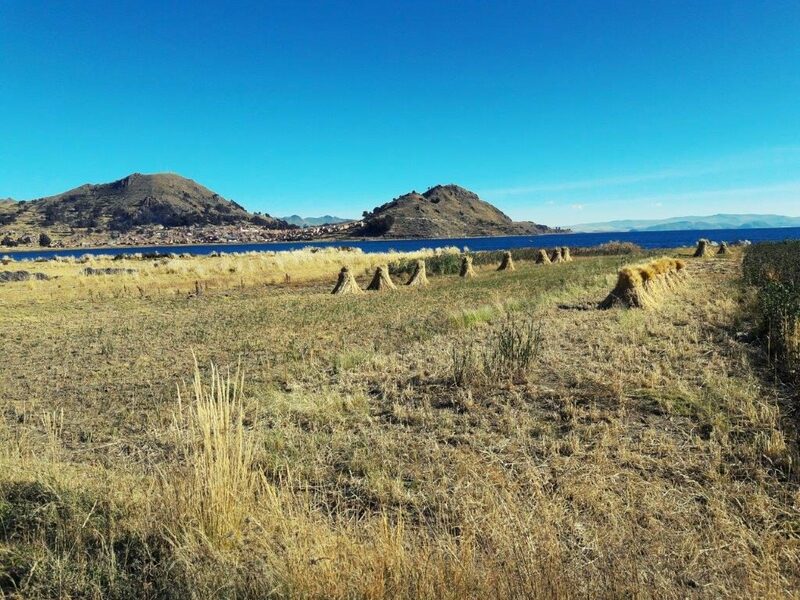 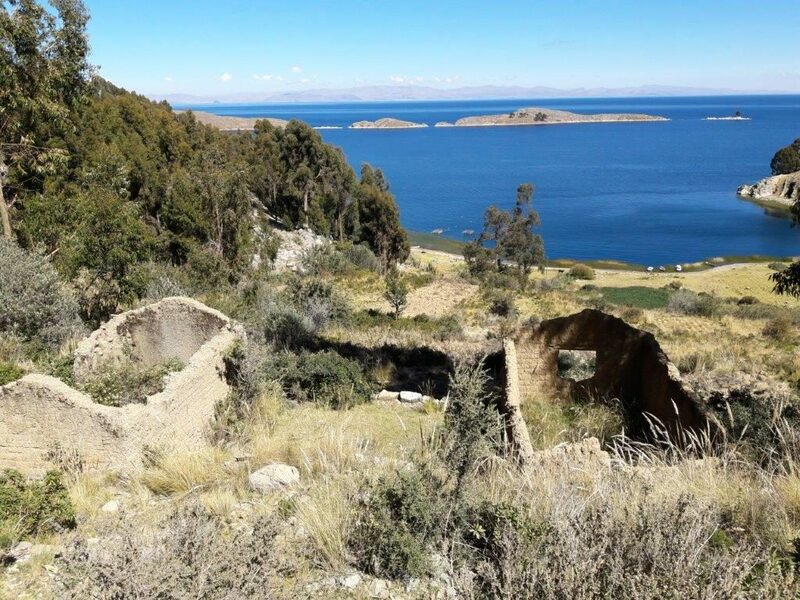 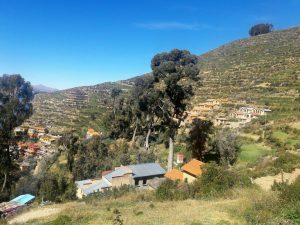 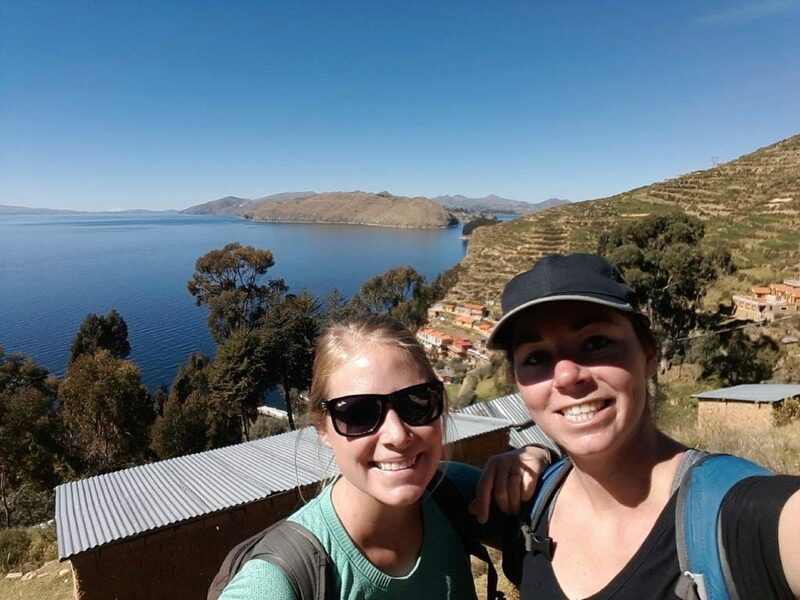 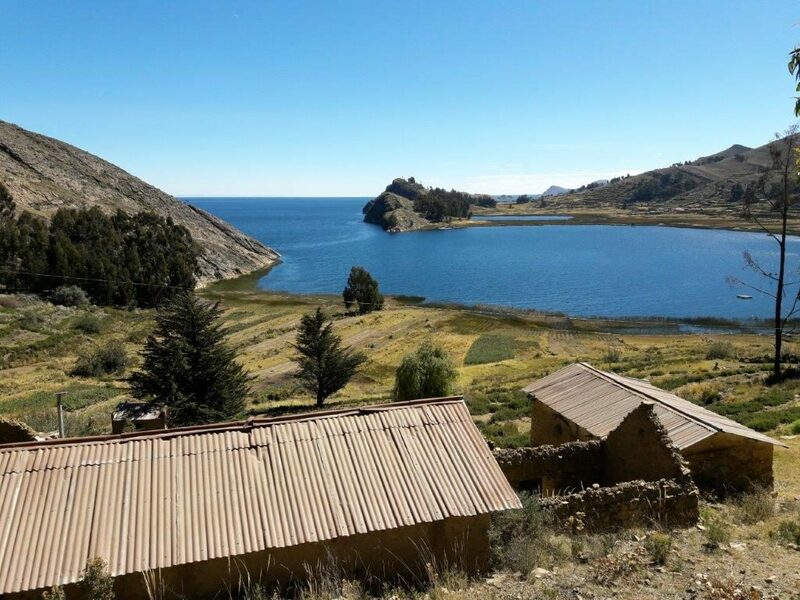 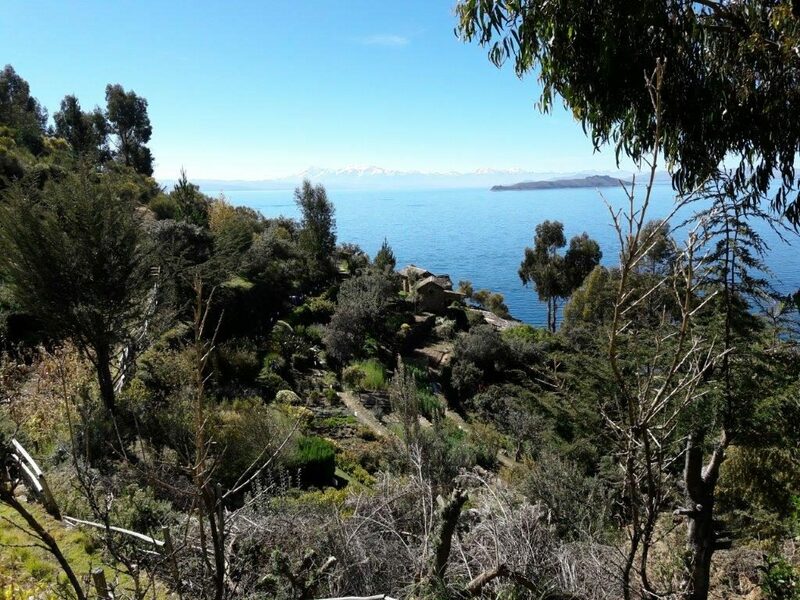 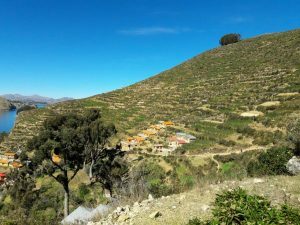 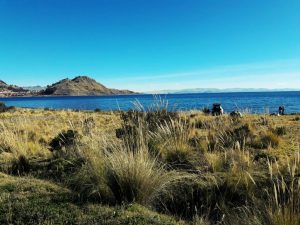 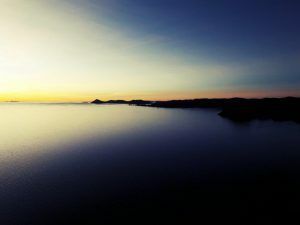 You not only get a clear wide view of Lake Titicaca, but you can also see the whole of the city itself tucked into the curve of the lake, nestled between the surrounding hills. 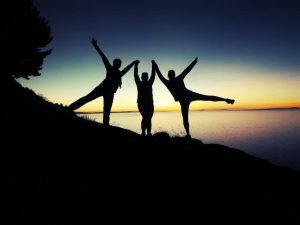 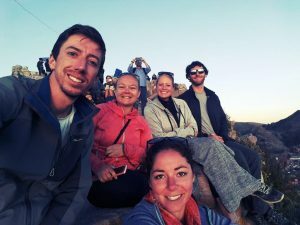 We stayed at the top for sunset and thoroughly enjoyed the experience. We also got some great pictures before heading back down to our hostel. 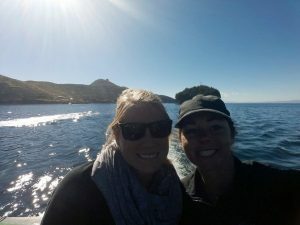 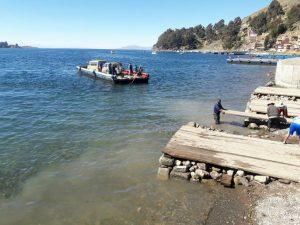 The next morning we waited for a boat to take us to the Isla del Sol. While waiting we pet a mama dog who had just had a litter of puppies underneath an upside-down paddle boat on the lake front. 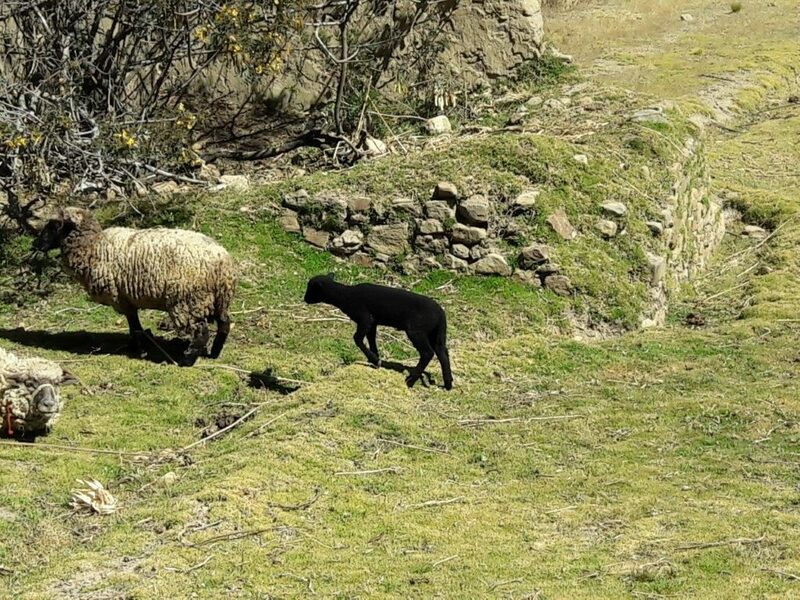 She was quite adorable and friendly except to one of the locals who she seemed to know and despise. 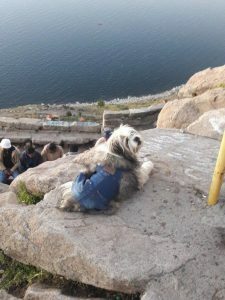 Several other dogs also joined us during our wait, and even when the boat arrived, one of them was so excited by the people that he attempted to come with us by boarding the boat. 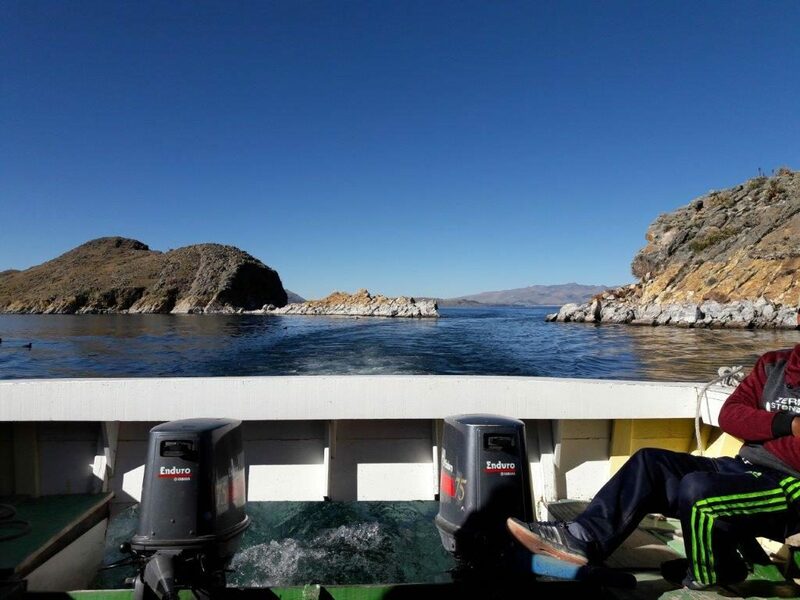 The crew took notice, however, and decided to kick him off before we got underway. 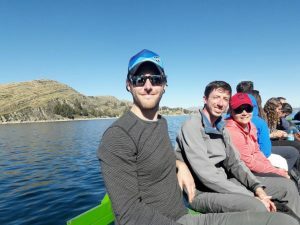 The boat ride across the lake was beautiful and passed several smaller islands and miles of coastline. 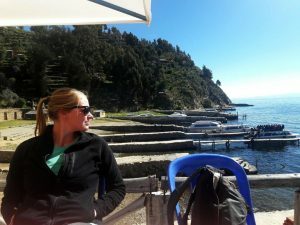 Once we arrived on the island, we grabbed some lunch before beginning our hike. 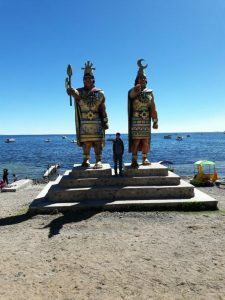 Due to recent disputes between the different communities on the island, we were only able to visit the southern section of it. 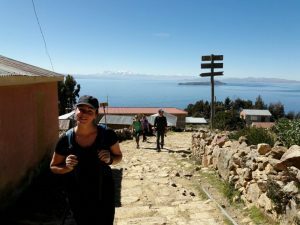 So, while we did not get to see the whole thing, we made a day of it, hiking up the steep winding roads to the ridge line. 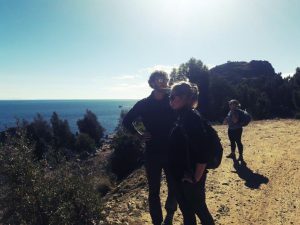 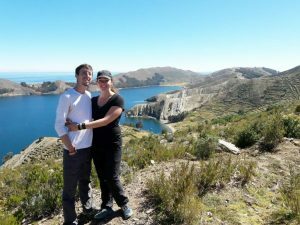 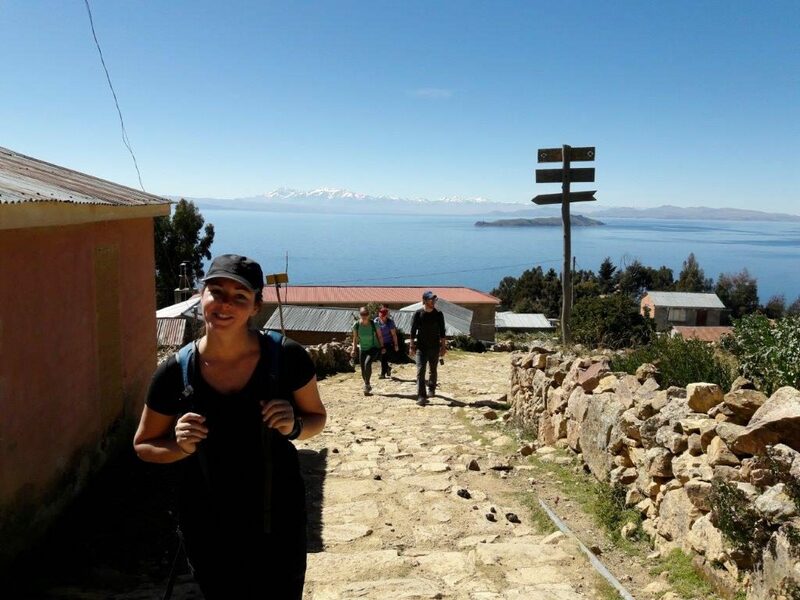 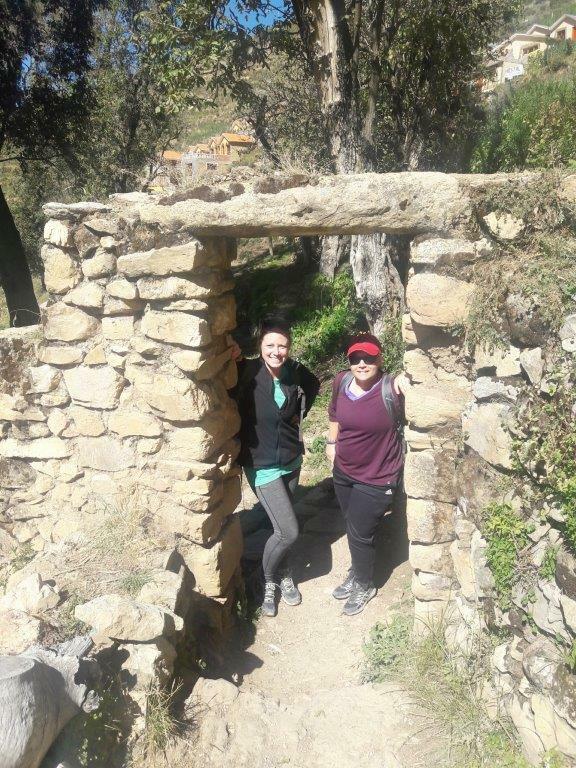 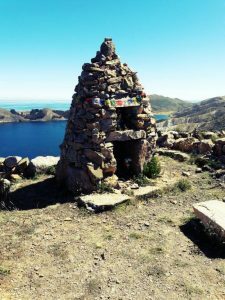 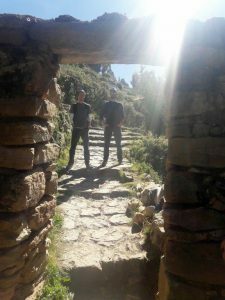 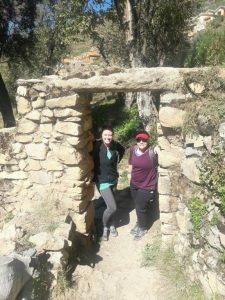 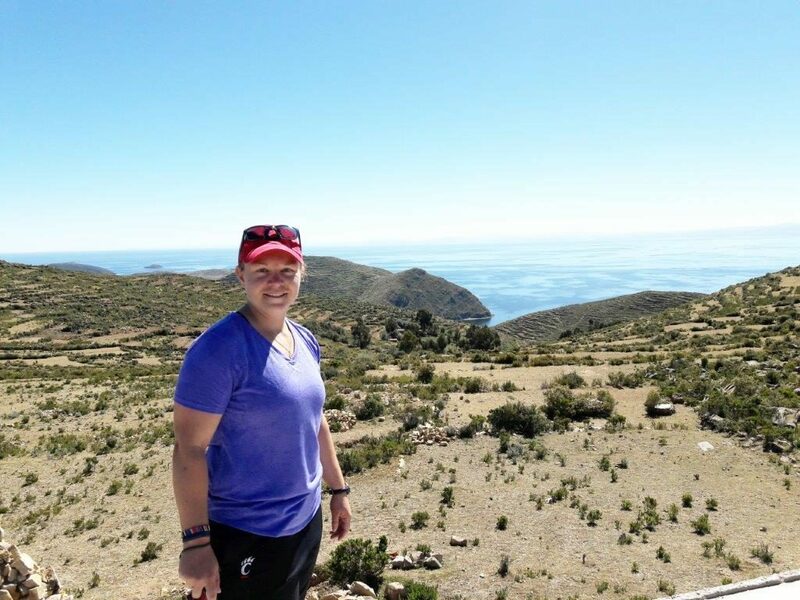 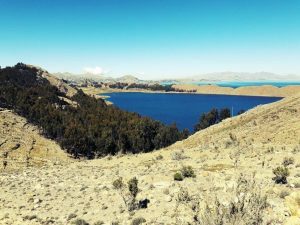 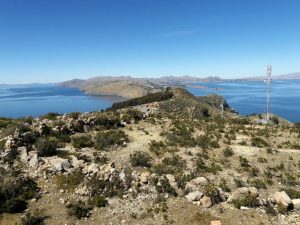 From the top, we were able to walk to a couple of different points, check out some ruins, and see the spectacular views of the lake and the surrounding snow-capped mountains. We enjoyed the scenery a bit more and then headed back to the boat and back to Copacabana. Man we must have been on a hiking kick, because the next day we decided to do yet another hike. This time, we were going to do our longest one yet. We got a taxi out of Copacabana fairly early and drove to the small lakeside town of Yampupata. 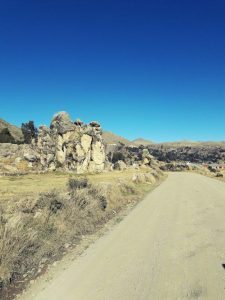 We had to stop along the route to clear rocks that had fallen into the road from the cliffs above, but we were not to be stopped. 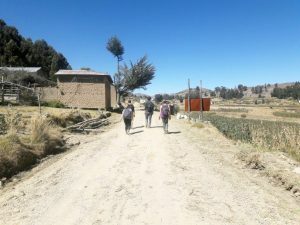 Once we arrived in the town, we were set to do an almost 12-mile hike back to the hostel. 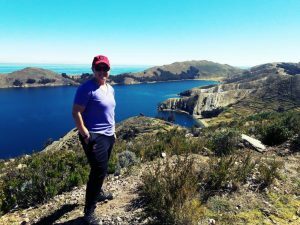 I really, really enjoyed this hike. 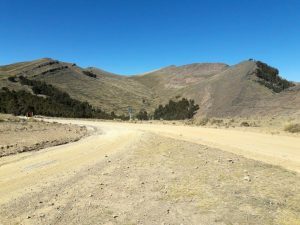 While it is along the dusty dirt road rather than a hiker-specific trail, the road is a seldom traveled route. 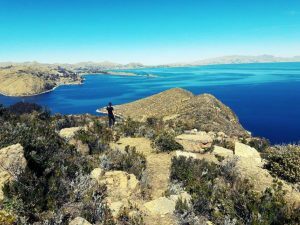 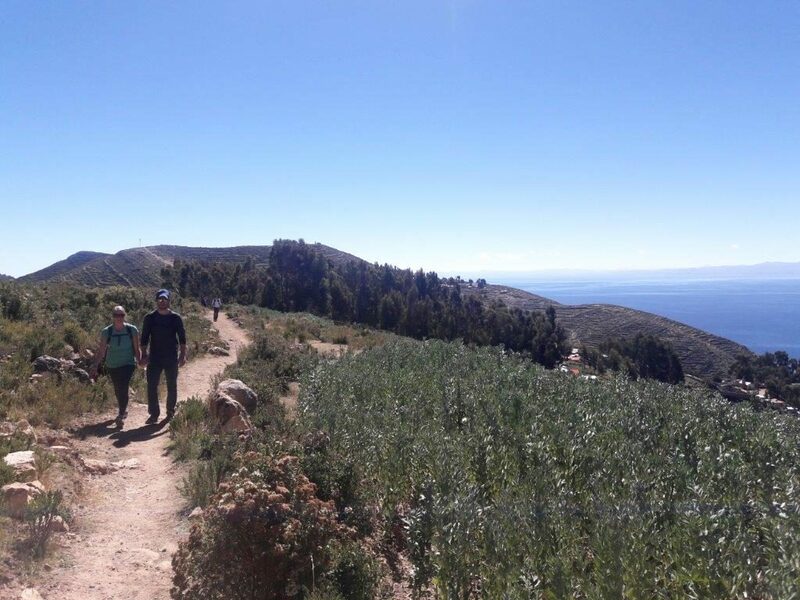 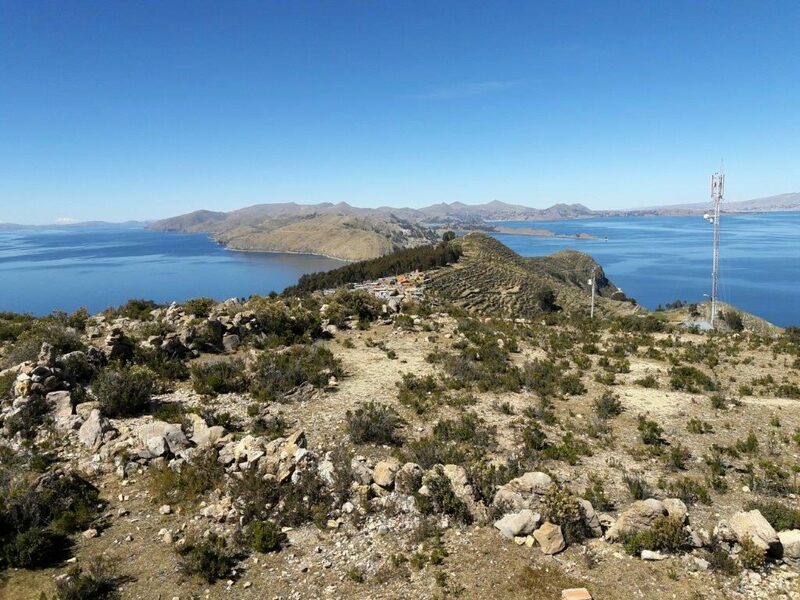 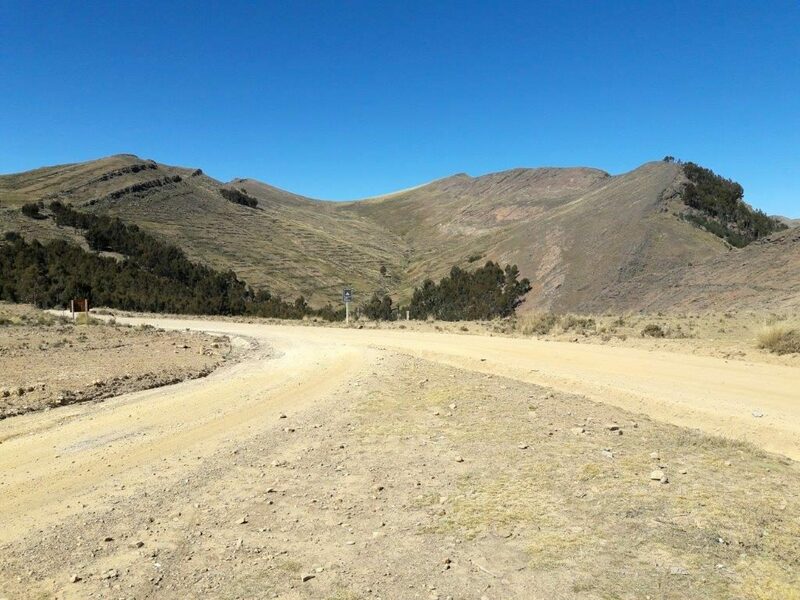 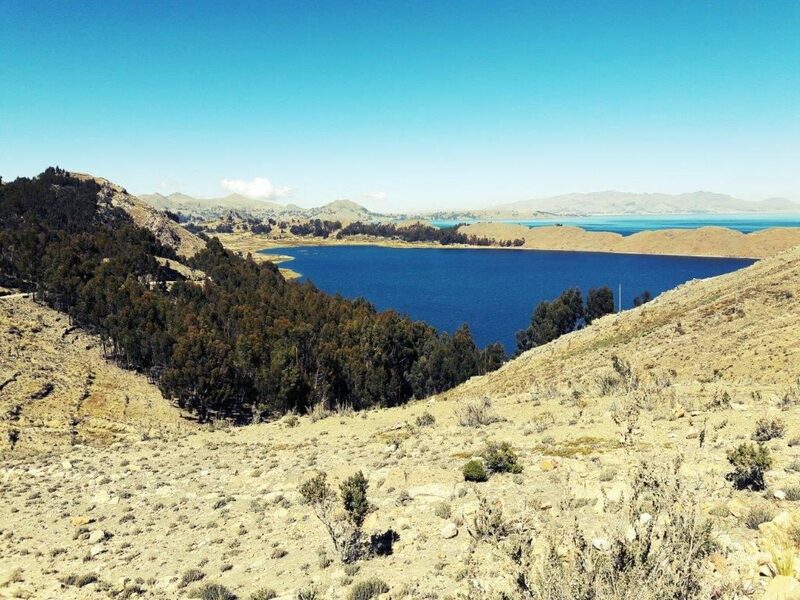 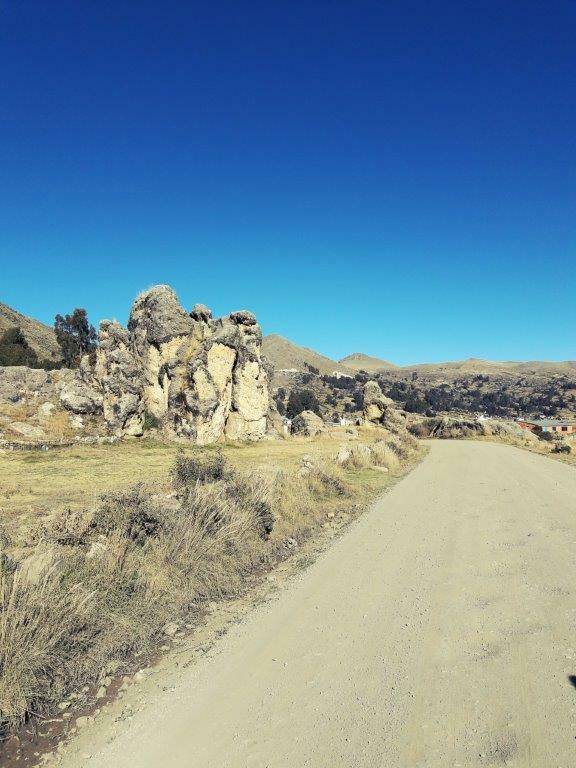 Along the way, you start with great views of the Isla de Sol and the Isla de Luna. 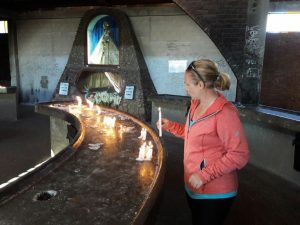 Almost the entire hike is along the coastline of the lake and even passes a shrine to the Virgin Mary. 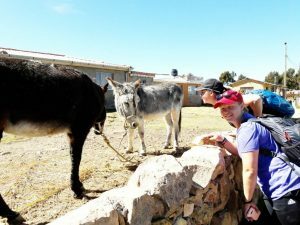 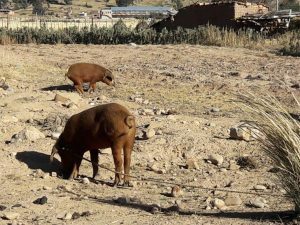 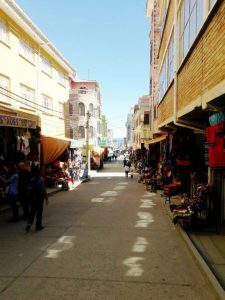 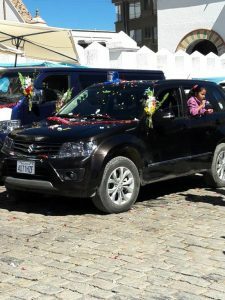 My favorite part about this journey was that you get a really good glimpse into the traditional and typical lives of the Bolivian people. 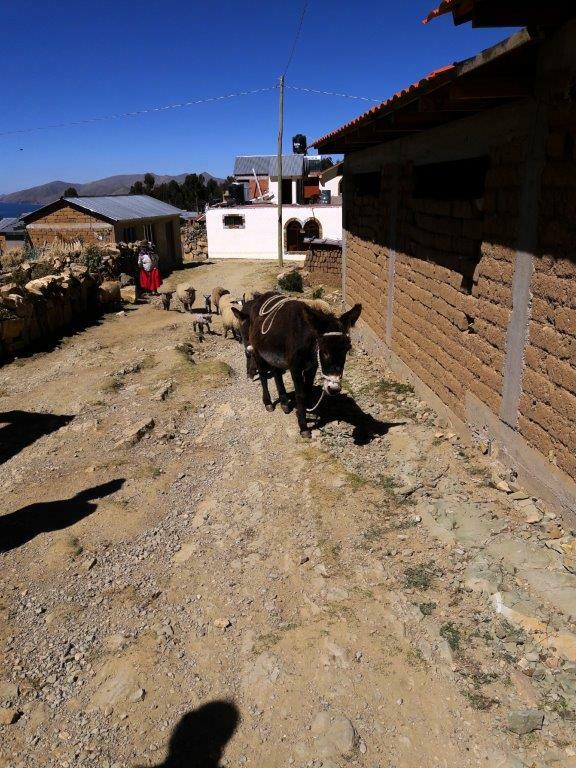 We passed other small villages, old farms, and local people going about their normal routines in the countryside. Although the hike is basically flat throughout, keep in mind that it is still at an extremely high elevation hike and you will wear out easier. We ate our packed lunches along the way, stopping at a beach on the lake for a break. We returned to our hostel happy, but exhausted and opted for pizza in our rooms that night. 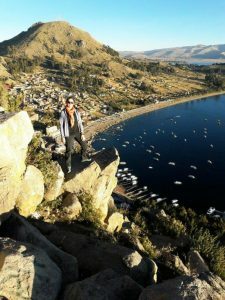 The next day, I was in rough shape. 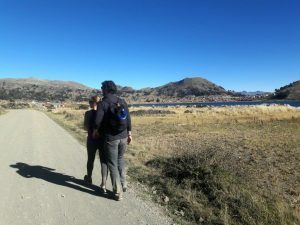 Not so much from the hiking, but I had come down with some sort of awful stomach bug and accompanying fever that kept me in bed for the entirety of the next day. Given how hard we had pushed ourselves the previous days, Katie, Justin, Adam, and Smo decided to take a break and spent the day lounging in the sun, downing some local spirits, and playing cards. On our last day in town, I was still feeling pretty bad, so I did not get out of bed until we had to be out of the hostel. 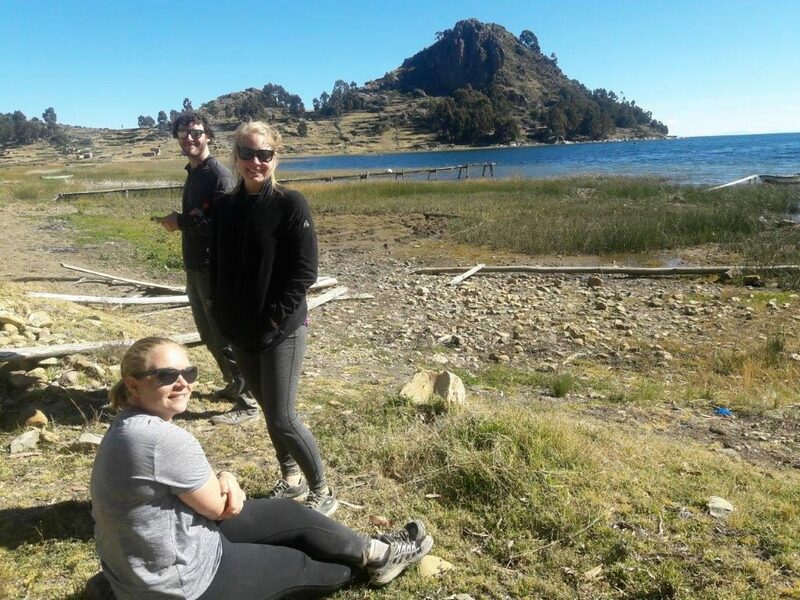 Everyone else was still feeling pretty lazy, but we managed to drag ourselves down to the lakeside for one last helping of Copacabana’s delicious trout. 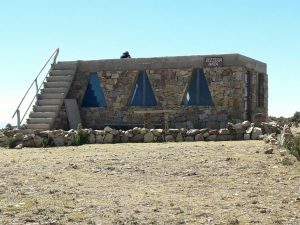 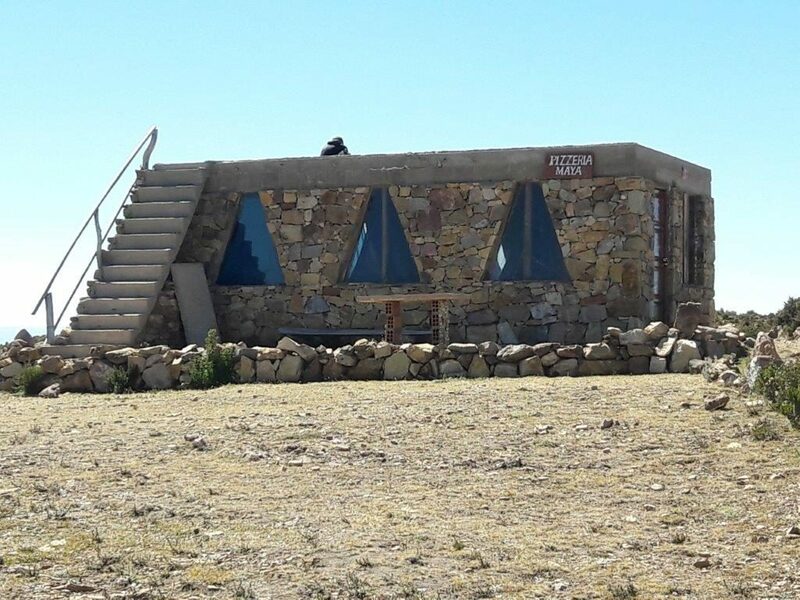 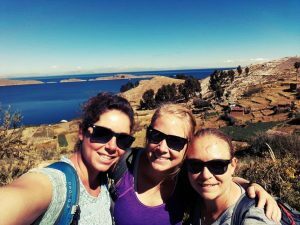 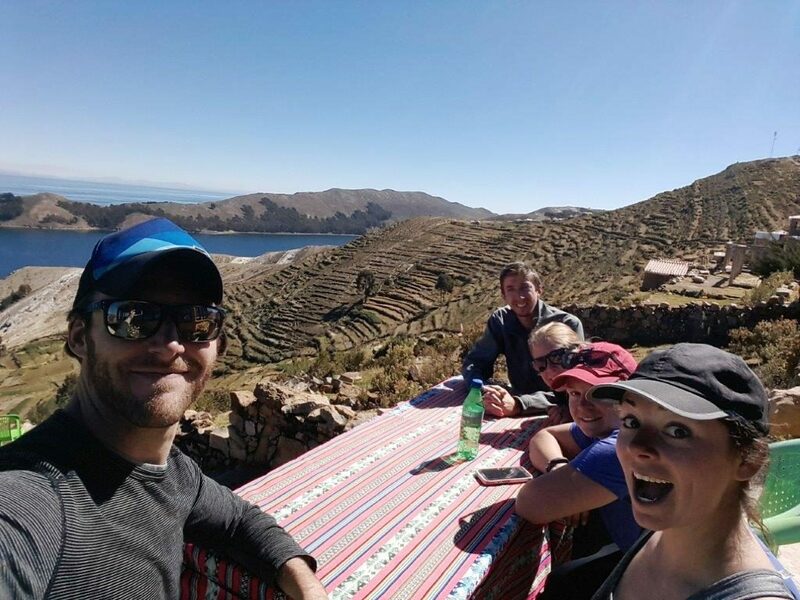 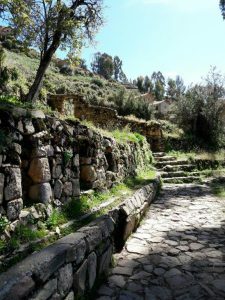 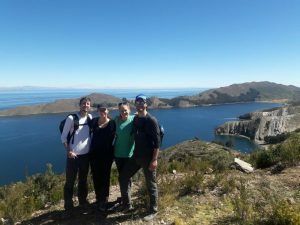 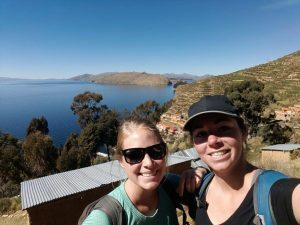 We sat outside at plastic tables, feasting on fresh-cooked trout and taking in our last views of Lake Titicaca and this amazing place. 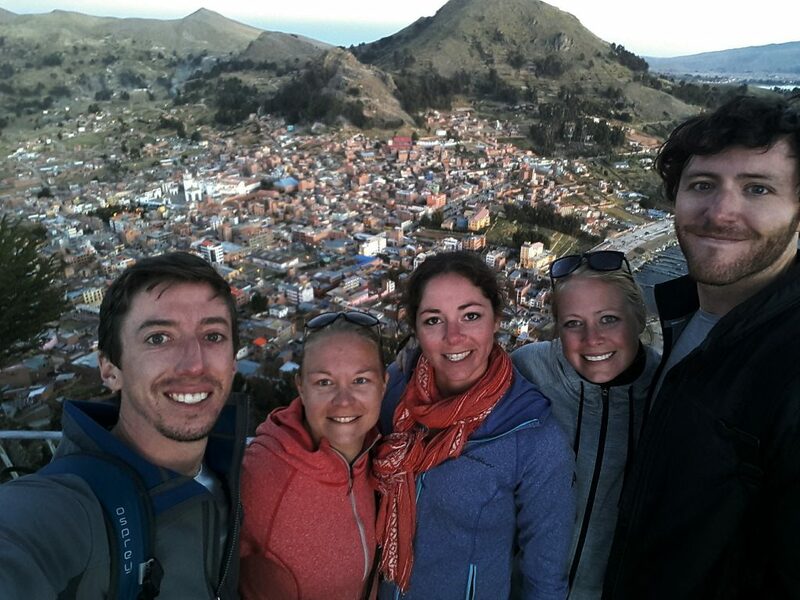 We boarded our bus out of town ready to take on the next adventure (except me…..still sick).